It could possibly become a ‘cult watch’. 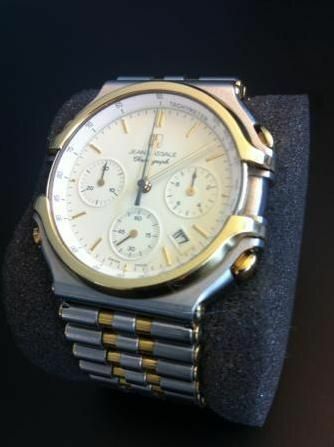 Not because it embodies the worst taste of 1980’s excesses, in the form of its questionably i(c)onic ‘Classical Greek’ styling with a high 18k gold content, in what was effectively nothing more than a very expensive Seiko quartz powered chrono, but because it contains the ultimate evolution of the Seiko 7Axx movement. 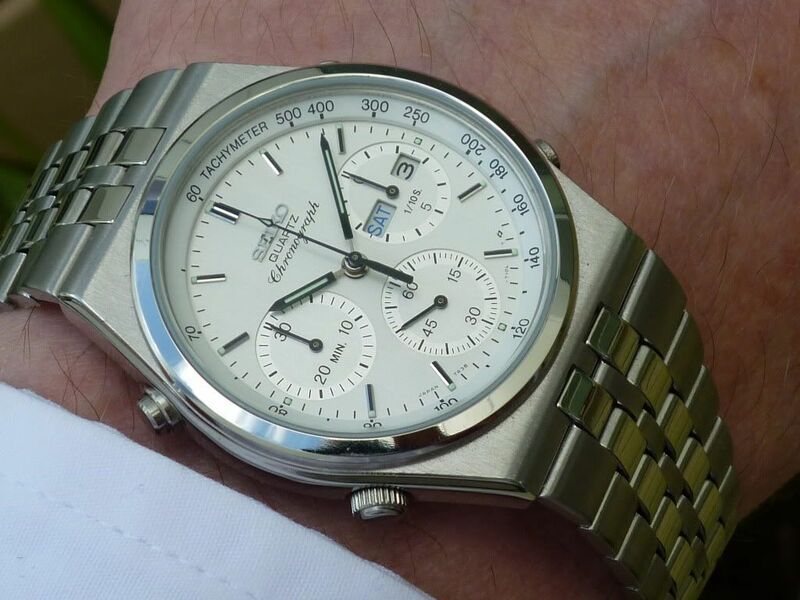 Something that a serious Seiko 7Axx 'and derivative' collector might aspire to owning. You know what ? I think I actually want one ! I’d planned to add one of these to my 7Axx collection, if only with impending redundancy on the horizon, as something of a ‘swansong’ to my current activities. Question was, which one ? As with the similarly highly priced Cartier Ferrari Formula chrono’s there were a number of permutations to choose from, so without a lottery win, one could never envisage owning more than just a couple of them. So far I've seen 3 model numbers used: 7A74 -017, -018 and -019, although I'm still not completely sure of their exact significance. They were available in all stainless steel; stainless and 14K or 18K gold (most commonly seen), and apparently also in solid 18K. 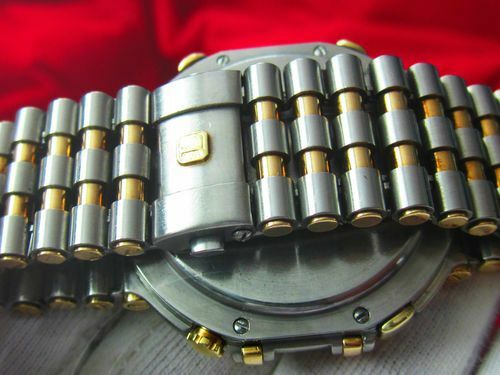 The majority came fitted with the vaunted ‘Rouleaux' style multi-piece bracelet, although there was also a factory leather strap option. There were (at least) two* different methods of bracelet closure used: hidden ‘snap-fix’ or a push-button release butterfly clasp. 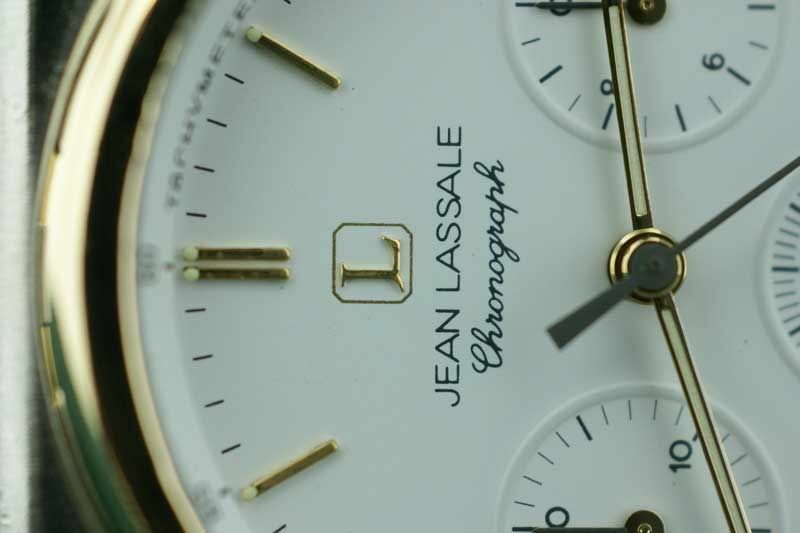 Dial colours I'd seen included: white; champagne (sometimes referred to as cream), black and black with gold subdials. Dials can be printed with or without ‘Swiss Made’; movements stamped ‘Swiss’ or ‘Japan’, accordingly. 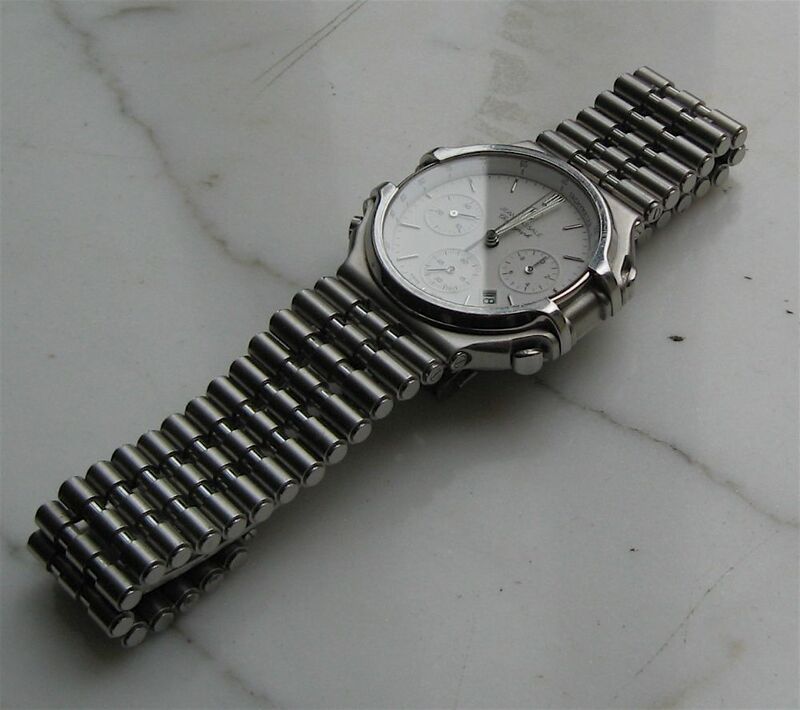 Until recently, probably my favourite permutation was the white dialed stainless and 18ct two-tone – on a bracelet naturally. 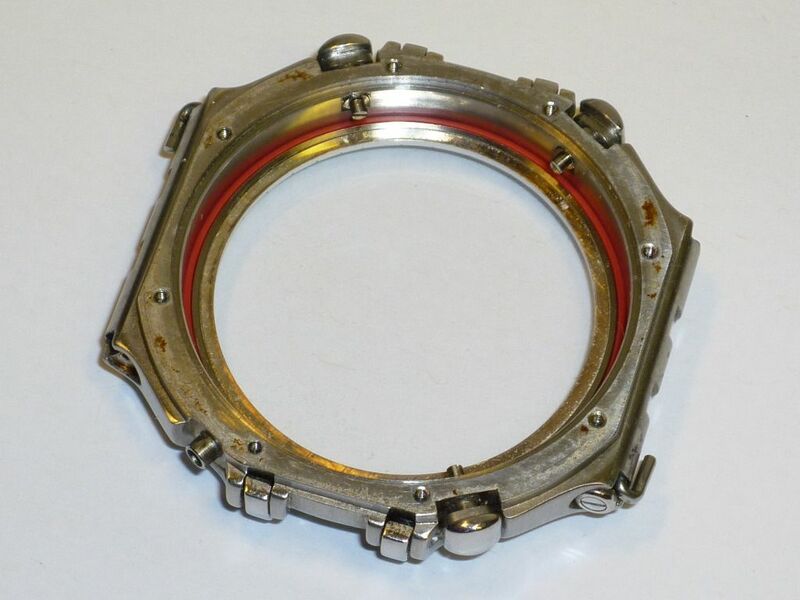 If you studied the photos, as I did, it had clearly had a couple of dings polished out of the bezel, and the bracelet looked rather tired, particularly where it joined the watch case. In close up, there also appeared to be some tarnishing of the dial batons. The other ‘gotcher’ for me was that it wasn’t a ‘Swiss Made’ version, unlike the cream faced version that they also had on offer. But then on top of that, with any watch coming from the States, one would probably have had to factor in the dreaded 20% VAT. So, as far as I was concerned, despite eBay sellers like 74Bricklin and Kasiart continuing to re-list their 7A74’s at ‘pie-in-the-sky’ prices, with no real hope of ever selling them, there was a precedent set - these things could be bought for under $1000. After initially dismissing the idea of ever owning a Thalassa 7A74 as a frivolous extravagance, my interest was rekindled in mid -July. 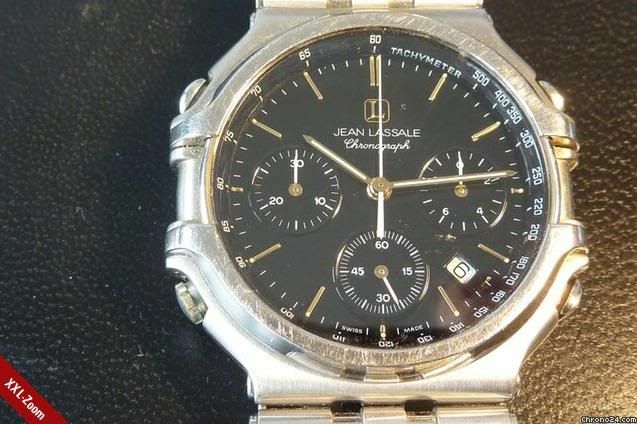 Cette montre est de 1996 et avait été achetée à l'époque 2400 Francs suisses. Elle est en bon état. Ce même modèle est actuellement en vente par d'autres sur internet à 1790 Euros actuellement. C'est l'occasion de réaliser une belle affaire puisque je démarre les enchères à 1 euro !!!!!! The opening bid was a suicidally low 1.00 Euro, with no reserve price. Incredibly, with 30 hours of the auction left to run, I was still the current high bidder – at a mere 20.50 Euros, and was already thinking about a (much higher) figure to snipe with, in the final seconds, when the inevitable eBay bid cancellation notification arrived in my email inbox. 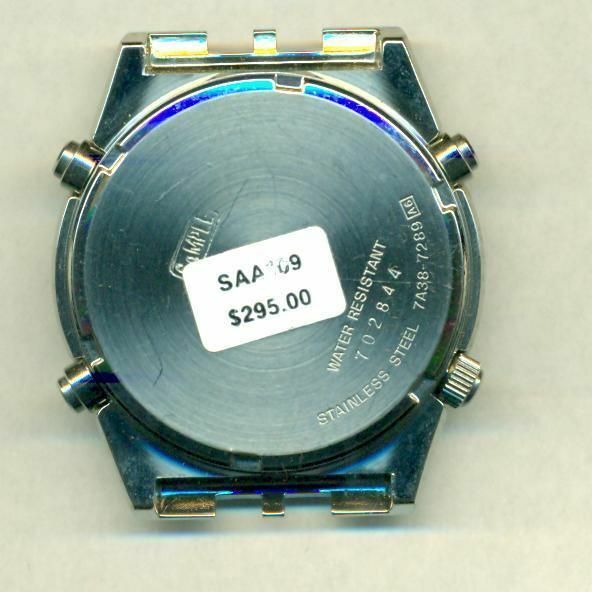 Looking back, it was probably a scam – in effect, nothing more than a covert plug for the grossly over-priced and almost identical appearing (right down to the scratches on the bezel) 7A74-017 on Chrono24.com which the eBay seller linked in their description. To me, the gold hands and batons on an otherwise all-stainless watch with black dial were just wrong - but probably OK on a two-tone. Plus that black on white date wheel (as opposed to white on black) would have bugged the hell out of me, so I'd have to change it. 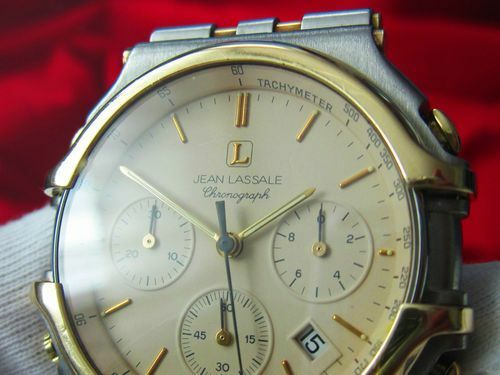 ORIGINAL JEAN LASSALE CHRONOGRAPH DATE Herren Armbanduhr!!! …. and with the Buy-it-Now price reduced to ‘only’ 670 Euros (compared to the previous 1000 Euros asking price). .... and made it 16 on one side of the pushbutton clasp, and 18 on the other - total 34. Each individual link measures approx 4.0mm. 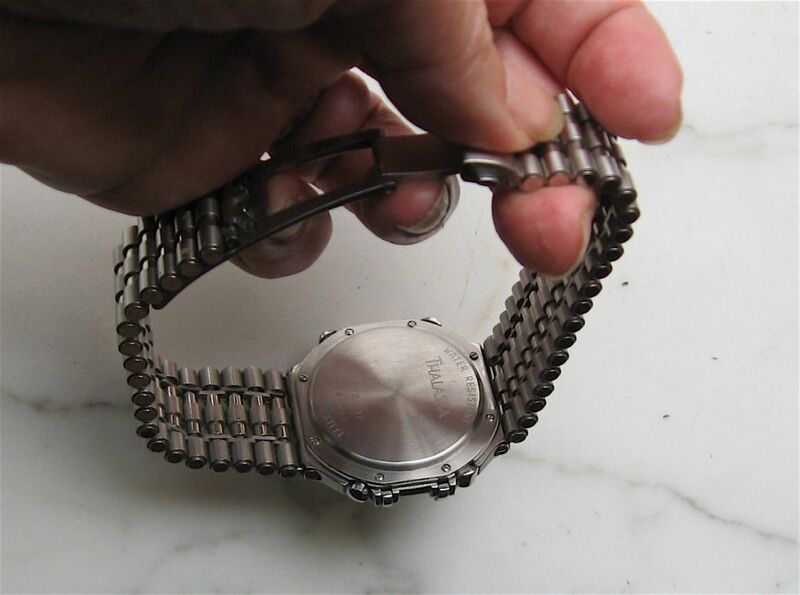 The one I subsequently bought has 19 links either side of the pushbutton clasp - total 38, and that watch comfortably fits a 7½" wrist. Then, of course, this one wasn't 'Swiss Made', either - and if I was going to buy one of these, that was an absolute pre-requisite. Although my original stainless black-faced 7A38-7270 is what got me started on 7A38’s, and is still a fond favourite, I’ve found myself preferring to wear these on a daily basis. I've also got far more two-tones (albeit only gold-plated) than any other finish of 7A38's in my collection. 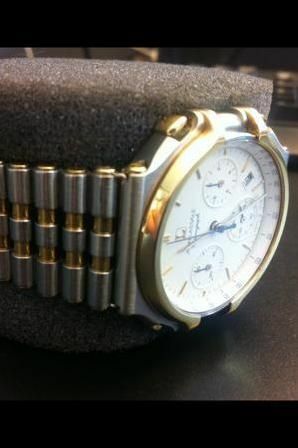 So, if I bought a Thalassa 7A74, did it really need to be a stainless and 18ct gold two-tone ? Did I need the bling factor ? 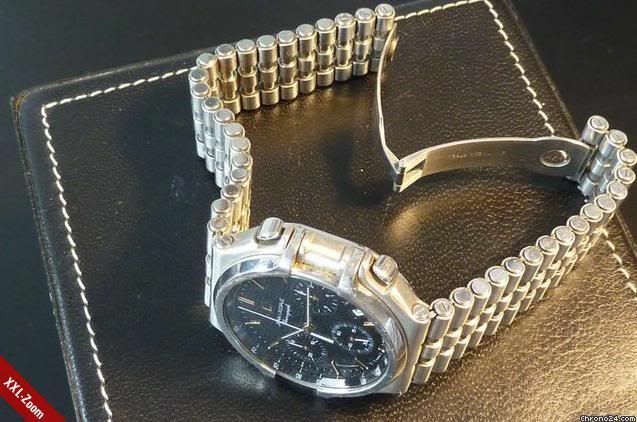 This all stainless watch is for the man who prefers not to wear dual tones. 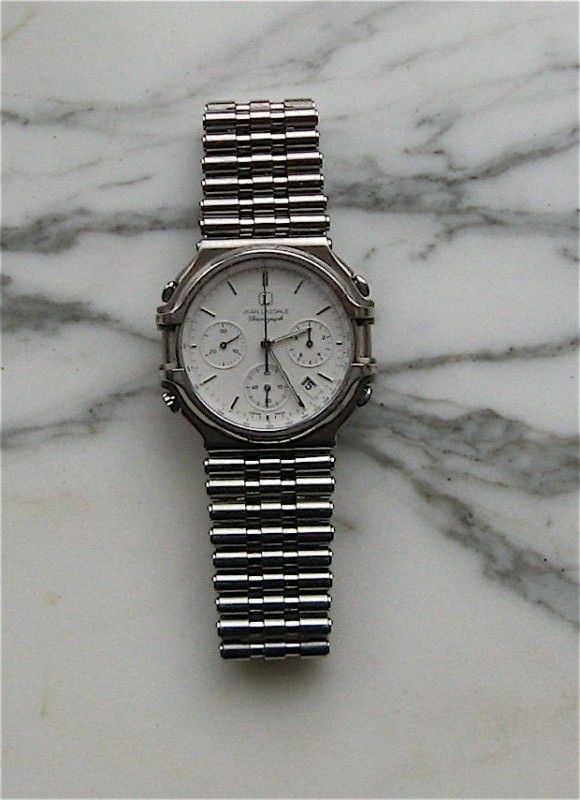 Originally purchased in 1991 the watch has had only one owner and has been worn infrequently. Will be sent with original zipper case and watch holder, outer box, instruction manual in 5 languages (English, French, German, Italian, Spanish), brief instruction folder, and original certifications (filled in). Zipper case interior shows age. See picture. 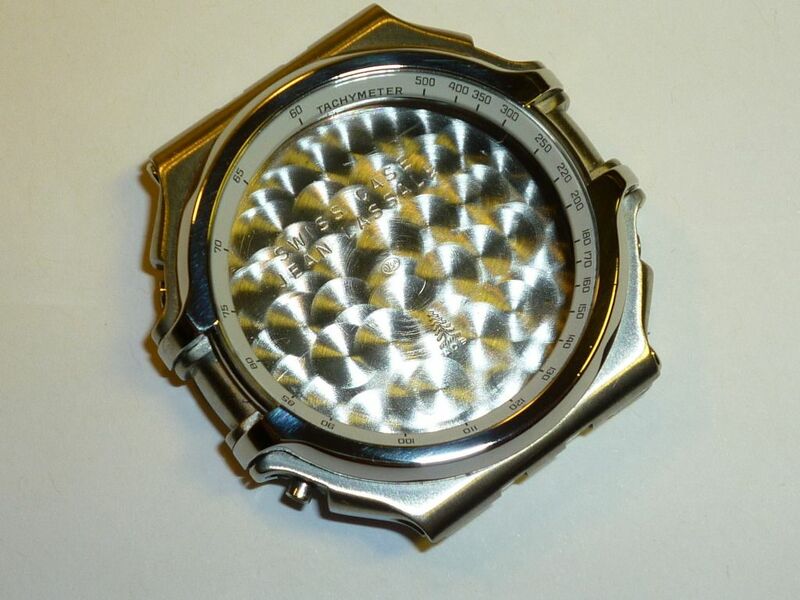 Watch crystal and top of bezel have light scratches which are not apparent unless making a close examination. Watch tested and is in working order. Inside is in like new condition, no staining, new battery. 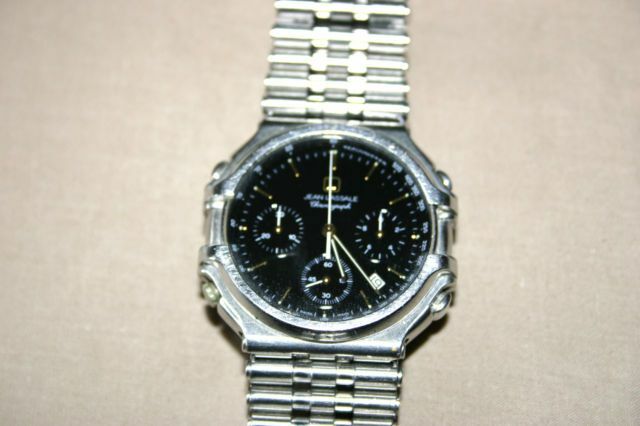 This is another 7A74-017 in all stainless steel - offered at less than half the price of the similar black-dialed version on Chrono24.com. It's also nice that this particular example comes with all its original boxes and papers. I contacted the seller through eBay, and asked a few questions of her, all of which she very helpfully replied to - and subsequently updated some of her listing information / description. I did consider making an offer for a while. 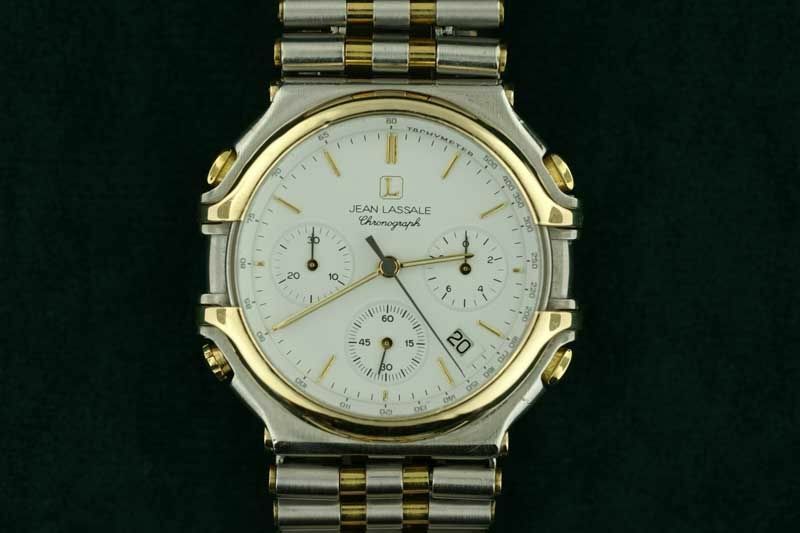 But then I found myself asking - What makes this all-stainless Jean Lassale 7A74 - without any 18K gold content (or a day window) worth up to 10 times the cost of the equivalent stainless white-faced Seiko 7A38-7280/9 ? In this instance, isn't it solely the cachet of being a (re-branded) 'Swiss Made' Seiko 7Axx - at a slightly more 'affordable' price ? 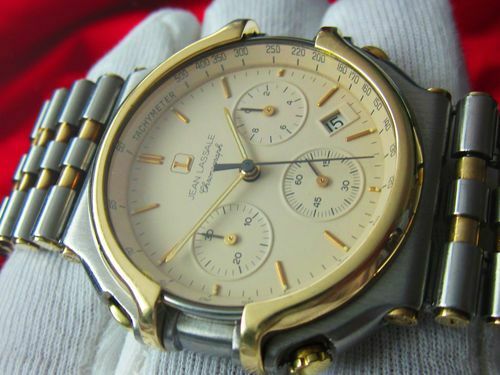 The watch had gone unsold at the orignal opening bid price of $950 but oddly the seller hadn't re-listed it, as many others do. 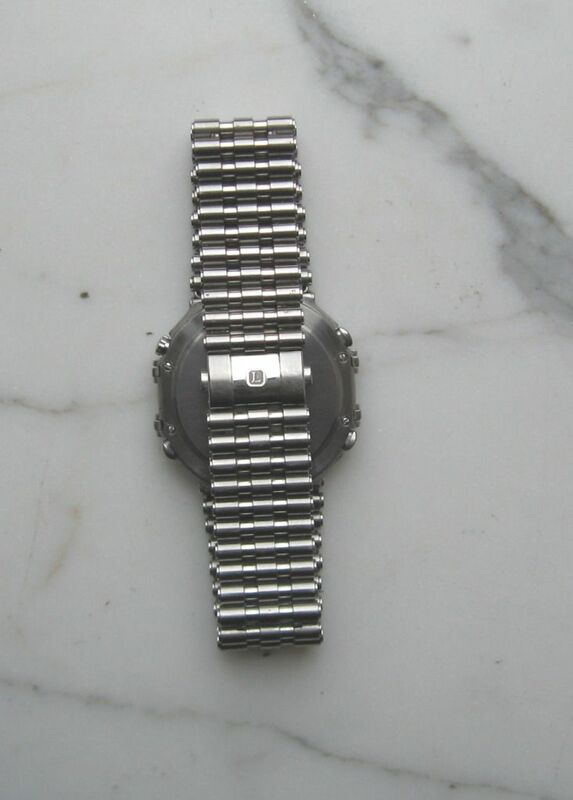 So, in the third week of July, I messaged the eBay seller, and asked if the watch was still available - seems it was. Emails were exchanged, and then I phoned the seller, and made an offer - somewhat lower than her previous eBay asking price. With very little haggling, we soon arrived at an agreed price - in fact, the figure which I'd actually had in mind paying in the first place. When we'd previously traded messages via eBay, back in May, I'd discussed with the seller, in principle, the possibility of her under- declaring the value for Customs. However, we'd not gotten over the stumbling block of insurance, if we had gambled on that strategy. Good news. 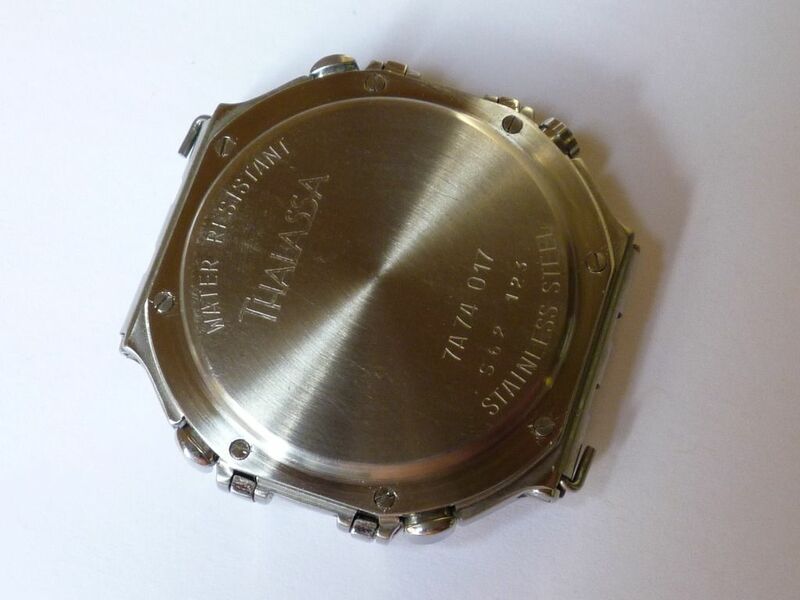 It turned out that her husband, who actually owned the watch, was coming over to the UK on business at the end of July, and she said he could carry it in his hand luggage - all parcelled up and ready to post by RMSD, on his arrival. I thereby managed to avoid those grabbing b*st*rds at Mount (un)Pleasant Royal Mail sorting office and paying them a totally unneccessary 20% VAT. 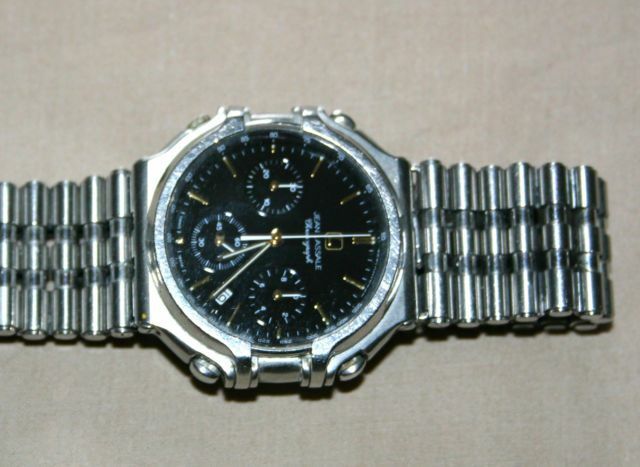 The watch ended up costing me about the same as you'd have to pay for a half-decent 7A28-7120 RAF Gen. 1. Seeing as I don't do military, and this watch absolutely exudes class, especially when compared to one of those, I know where I'd rather spend my money. I expect they're somewhat rarer too, probably in the ratio of 1100 JL Thalassa 7A74's to 11,000 Seiko RAF Gen 1's produced. Why 'Poor Man's ? 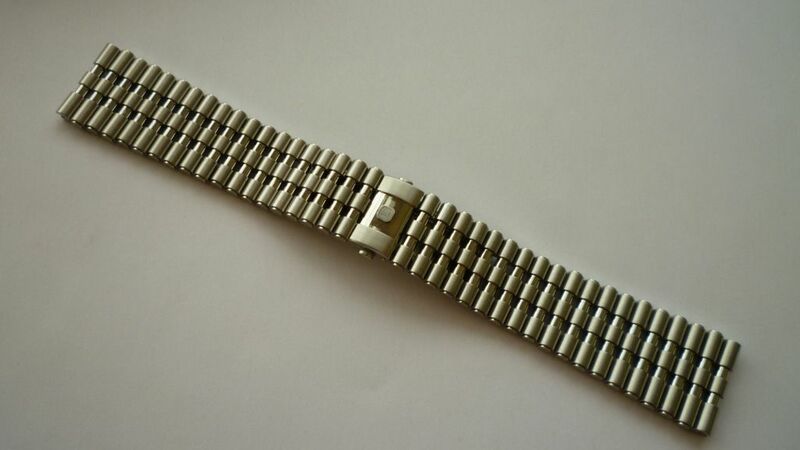 Well, this still cost me more than I've ever spent on any Seiko 7A38, so I'm poor now - and it's got no gold ! One of the reasons I decided I wanted this particular Thalassa 7A74, was that it came with all its original boxes and paperwork. I know some of its history too. It was purchased by then Advertising Sales Manager of the New Yorker magazine, for the man who became her husband. She bought it direct from the wholesaler who advertised with the New Yorker. 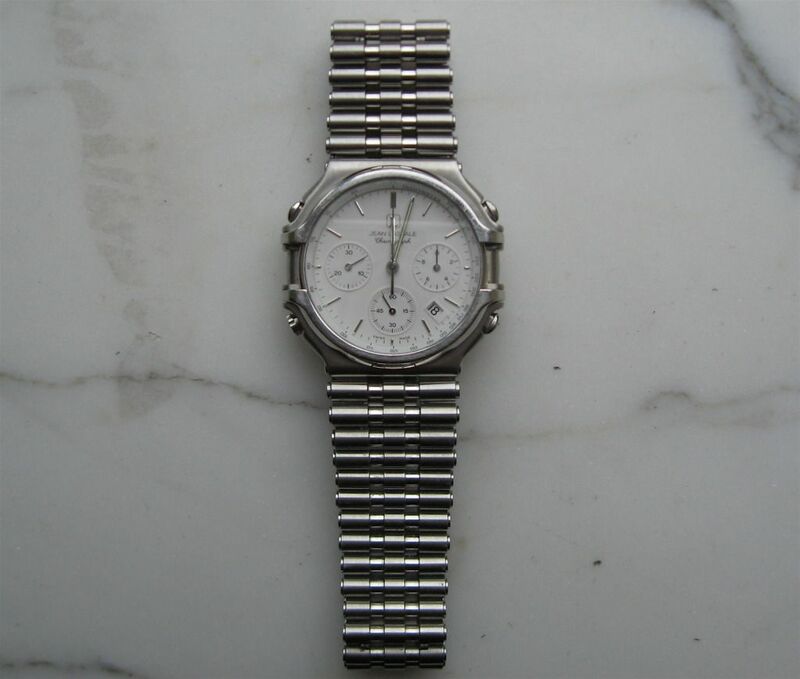 Although the watch was actually manufactured in February 1986, she bought it on July 31st 1991, per the stamped and dated warranty booklet - I bought it exactly 21 years later. The instruction booklet is like new, but the printing is in a subtle shade of grey, rather than black, which doesn't scan particularly well. 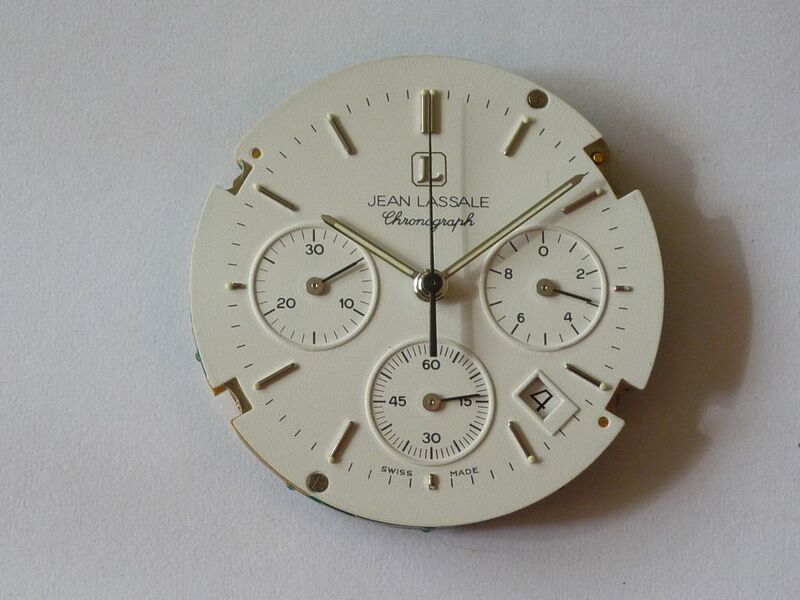 You are now the proud owner of a Thalassa Quartz Chronograph from Jean Lassale Cal. 7A74. 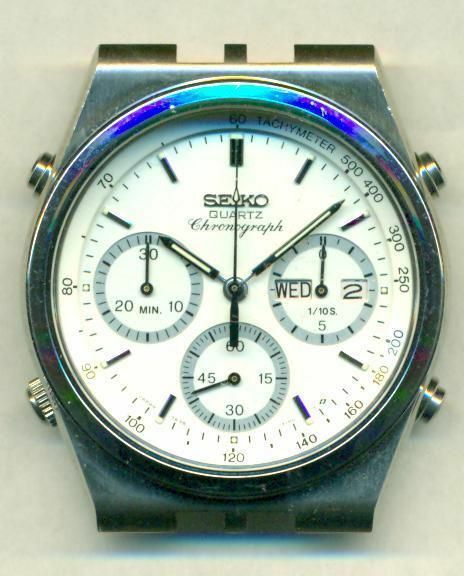 The format will be familiar to anyone who owns or has read through any of the Seiko Cal. 7A28 / 7A34 / 7A38 / 7A48 manuals. 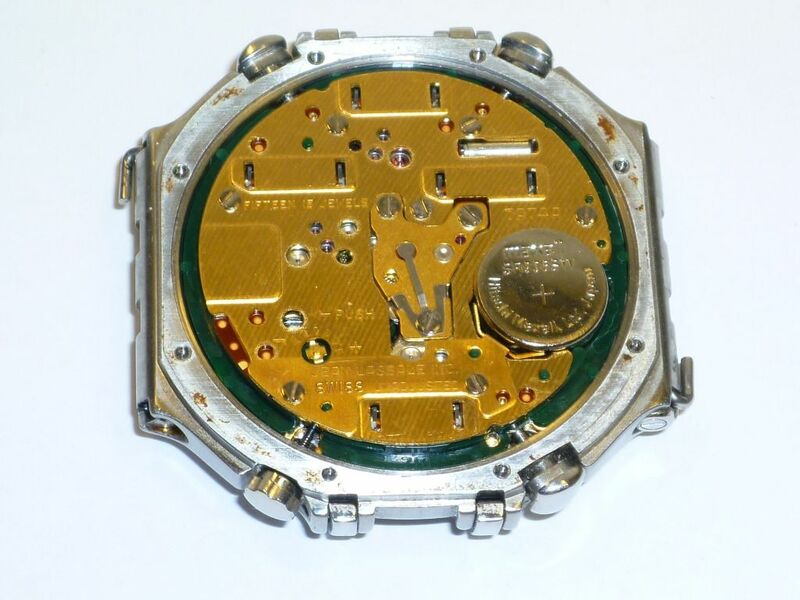 Particularly page 3 of the Seiko Cal. 7A38 manual, which apart from the typefaces and illustration used is virtually identical. 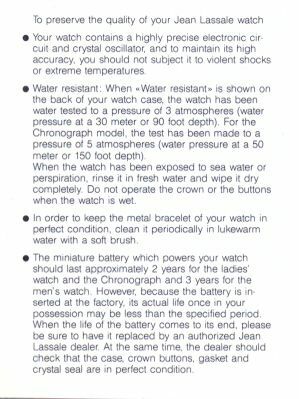 Of course there is absolutely no mention of Seiko Corporation and the manual's back cover states 'Printed in Switzerland'. 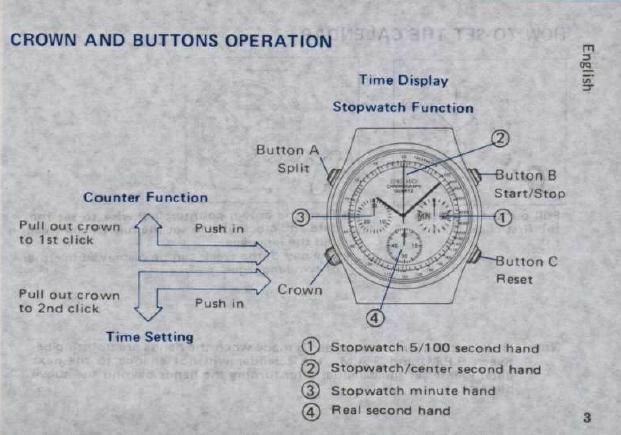 Throughout, all the illustrations are obviously a Thalassa 7A74, rather than the generic 7Axx watch heads used in Seiko manuals. Generally, I'm pleased with my purchase. I wore it most of the week, and it garnered a few admiring comments, despite its subtlety. It feels considerably heavier than a 7A38 - even the hefty-looking 7A38-6020, mostly due to the bracelet. I'll do some comparison weighing later. Overall, it gives an impression of being extremely well engineered, particularly as this one is in all stainless steel. 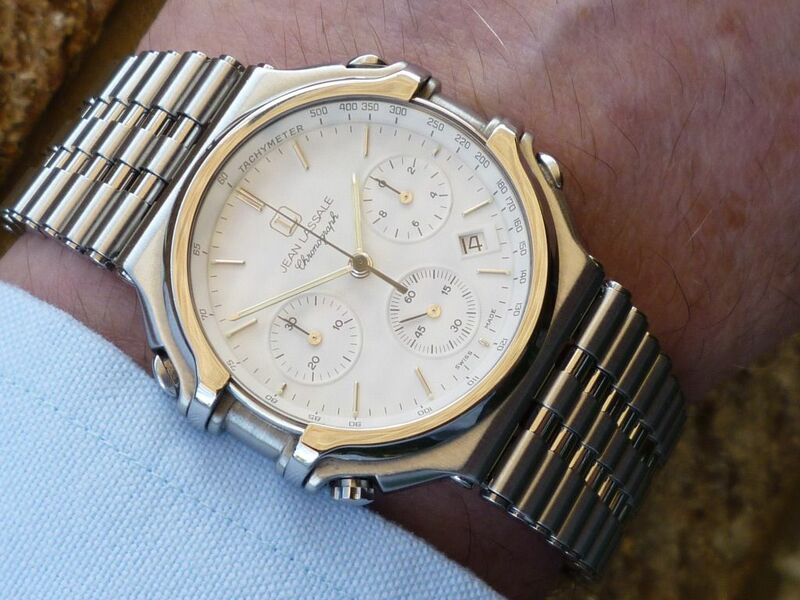 One could almost call it the Rolls Royce of Seiko 7Axx's. Wash my mouth out !! A downside is that the dial, even the time, isn't always particularly easy to read, especially when compared to my stainless 7A38-7280. The hands and batons are polished stainless, and the dial printing is dark grey rather than black, so there is rather less contrast. 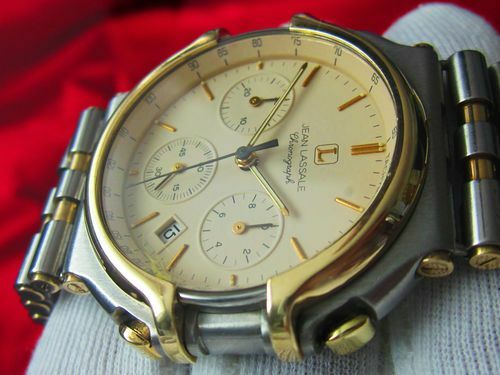 As far as received condition goes, the watch has some issues, commesurate with probably having been worn rather more often than just 'infrequently', and on special occasions (as I was later told by email). 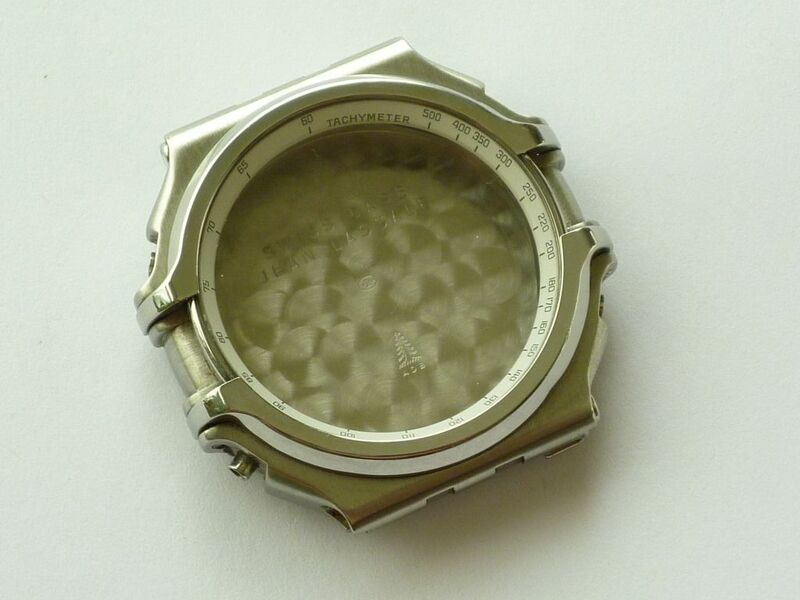 Most obvious is the grazing to the bezel, particularly in the area of '400' on the Tachymeter scale. This disappointed me intensely at first, because although the seller had mentioned scratches in her eBay description, she had also told me that she couldn't even feel them with a fingernail. Those few near '400' you certainly can !! My initial thoughts were of possibly attempting to fill them by lazer welding, or silver soldering, before lapping and re-polishing. 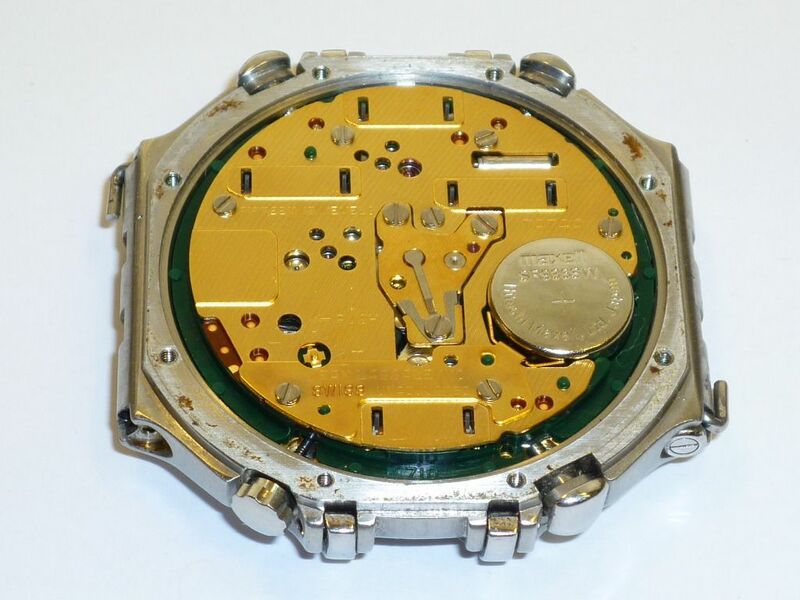 Although all the chrono' functions work perfectly, and (you can tell) the movement switch lever actuators inside have a reassuring clicky feel to them, both the 2 o'clock and 4 o'clock pushers stick in when operated, and need physically pulling back out again. The bracelet is in generally nice condition, but in need of a good clean, with a couple of minor unexplained marks on a few links. 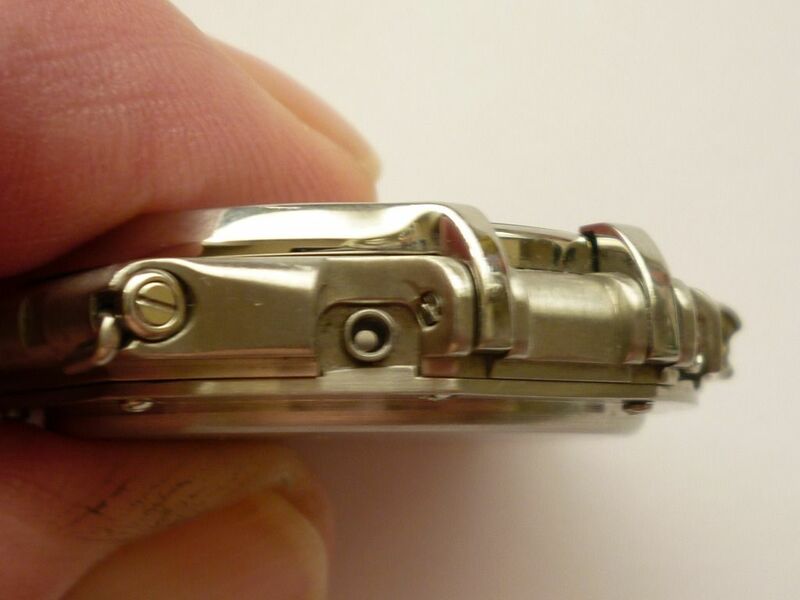 What annoyed me more than anything was the state of the case-back screws (and the area of the case-back around them) - likely the consequence of 4 or 5 battery changes over the years, by various ham-fisted watch-botching high street jewellers - of more anon. the weather is cloudy and overcast; the available natural light isn't the best, so some of the following photos were taken by artificial light and / or flash. Please excuse the slightly variable quality. First job was to remove the bracelet. 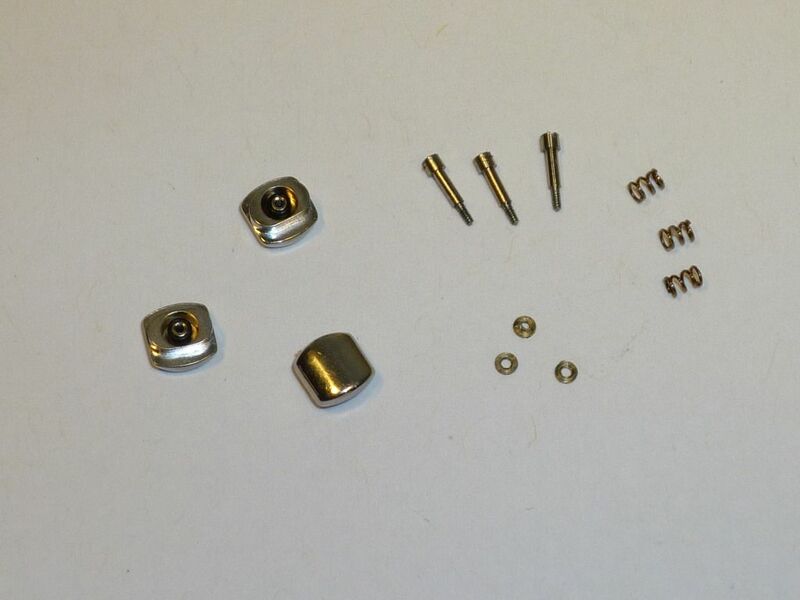 The smaller diameter cup washers (shown with their screws) fit in the machined recesses in the watch case. 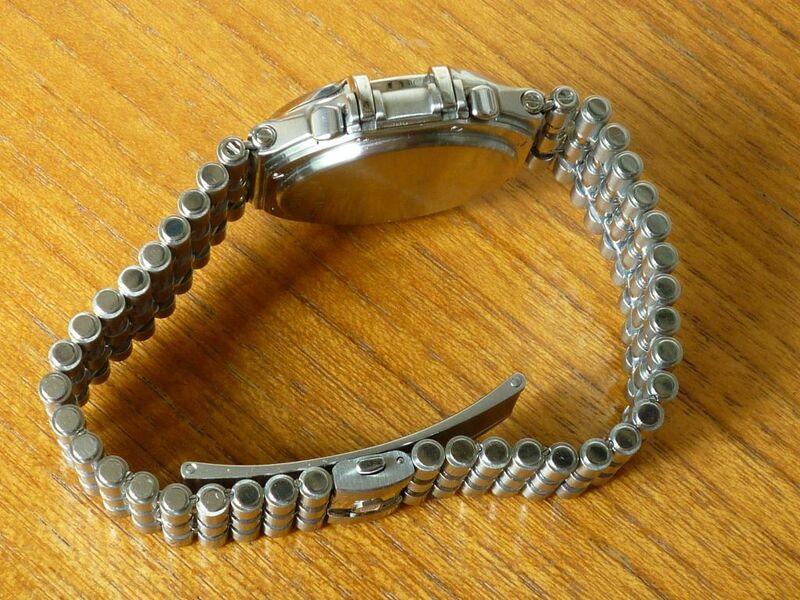 The slightly larger screws and cup washers also form the finishers to the ends of the bracelet's first joining links. I believe this is also one of the methods used for bracelet adjustment links on some Thalassa bracelets. Mine is different to others I'd previously seen. 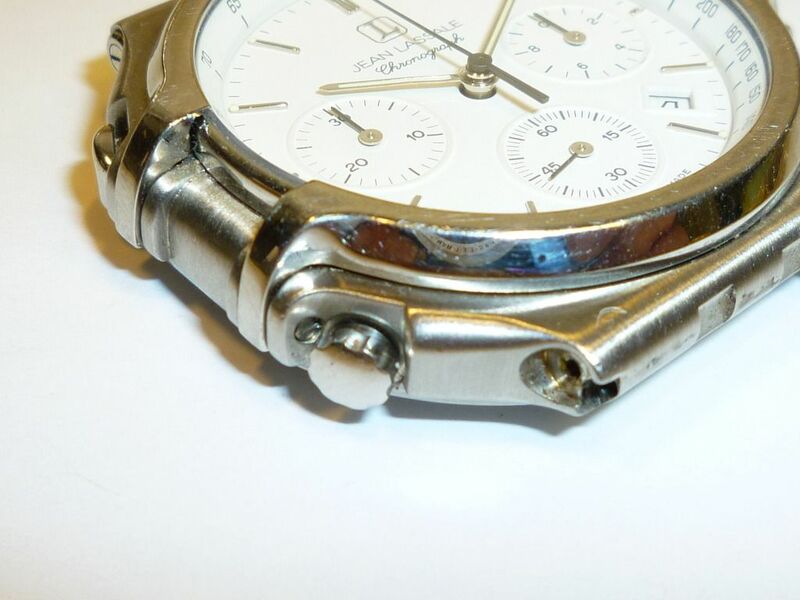 Despite the graunches on the bezel, the main part of the watch case is pleasantly almost free from dings. In the next photo, you can just make one out near the crown. It's the deepest I've found so far, and I probably won't even bother with it. Here, I was trying to zoom in on one of the tiny machine screws which holds the bezel to the watch case (and failed miserably). The bracelet overall measures a shade under 165cms / approx. 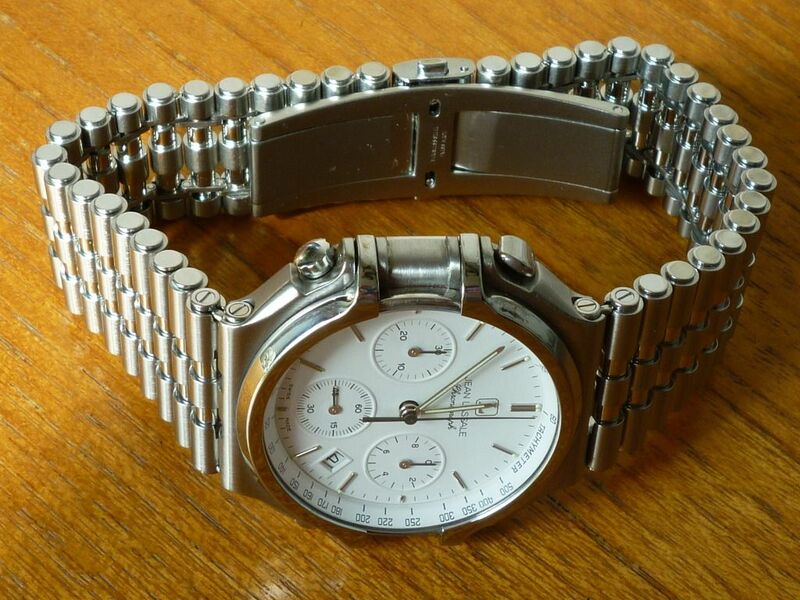 6½" - that's with 19 links either side of the pushbutton clasp. Note that my watch, although a 'Swiss Made' variant is fitted with the 'L' logo'd push-button release butterfly clasp. So the earlier assumption I'd made, in the previous Jean Lassale Thalassa 7A74 thread, about methods of bracelet closure versus variations (based on what I'd seen to date) is incorrect. In fact there were three different methods of bracelet closure. Of more anon. 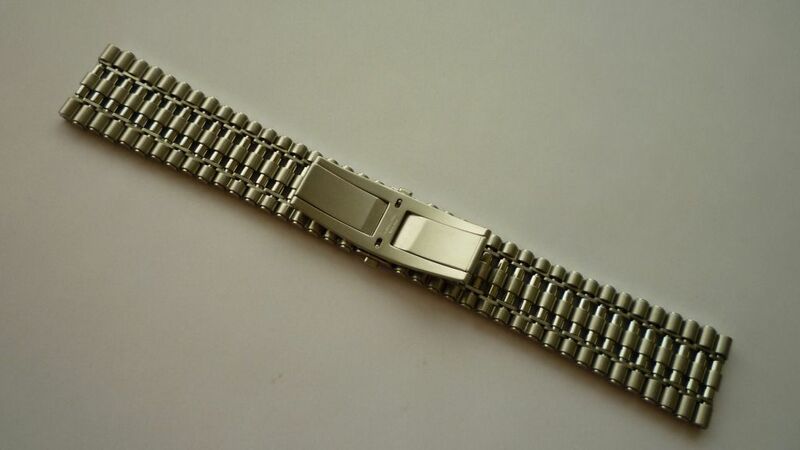 The underside of the butterfly clasp is stamped STAINESS STEEL, SWISS MADE. 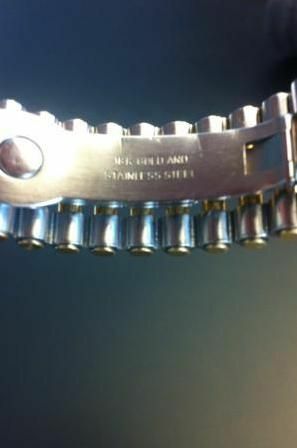 Just like the bracelet, it is beautifully 'engineered'. Remember that well-used Jean Lassale advertising slogan ? 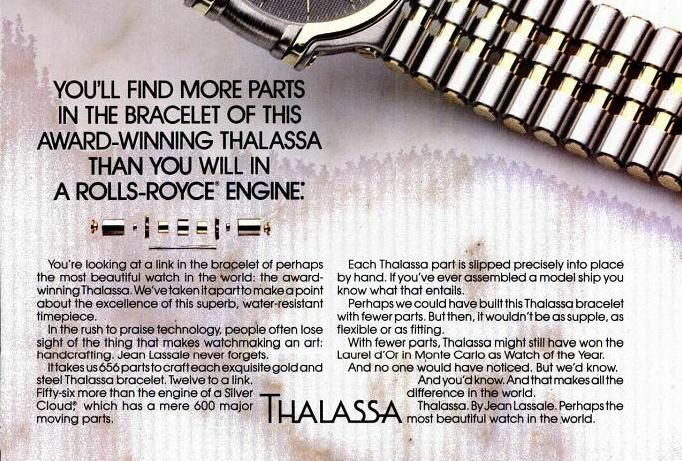 You'll find more parts in the bracelet of this award-winning Thalassa than you will in a Rolls-Royce engine. Note also the tiny bracelet link screws in between the last two pairs of links in the bottom RH corner of the photo. These facilitate removal of adjustment links - presumably in pairs on this particular bracelet. 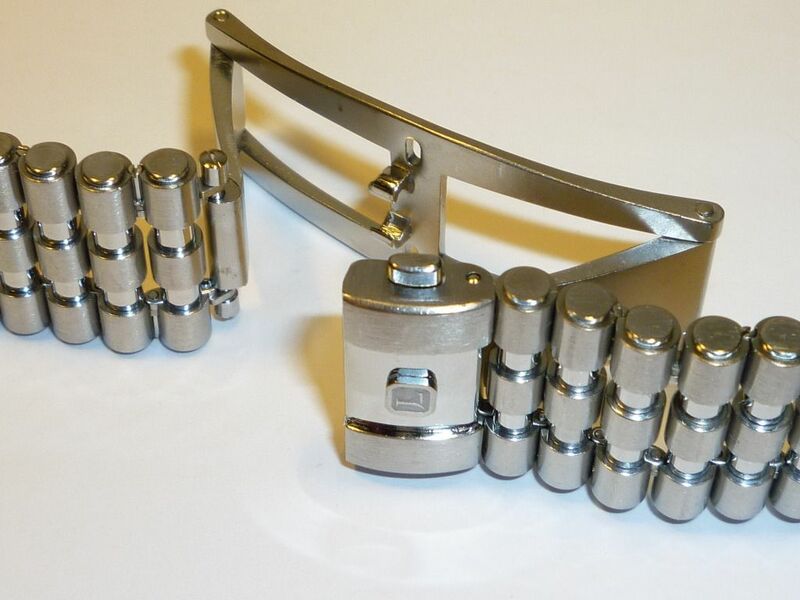 This differs from what I'd previously seen (in photos) of other bracelet adjustment links, which appear to be retained (singly) by cup and slotted screw, and presumably a 'U' shaped wire. So, yet another manufacturing variable. Now to the ugly part. The screw underneath 'STAINLESS' was cross threaded, and barely held in. That above 'WATER' is a replacement non-original screw. Of the remaining 6 screws, 3 were only screwed in 'finger tight', and only two screws hadn't had their slots butchered at some point. You know how lighting in photographs can hide a multitude of sins ? Well compare these two !! But finding some new case-back screws may not be quite so easy. They're domed M1.0 slotted pan-heads, 1.4mm long. Pretty tiny. http://www.microscrew.co.uk/ and / or http://www.modelfixings.co.uk/ may well be receiving a phone call in the not-too-distant future. I did manage to get the case-back off without inflicting any further damage myself. Using the right size screwdriver helps ! 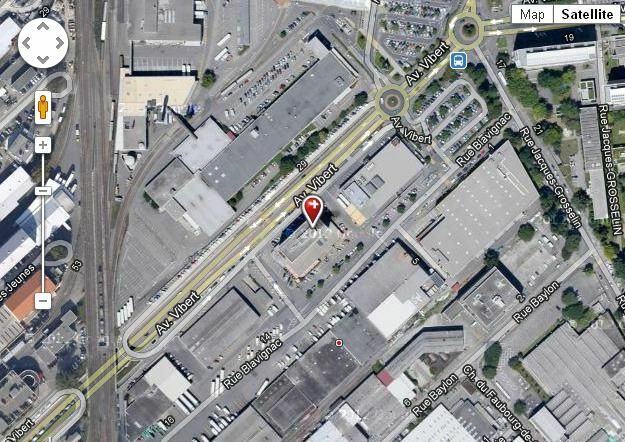 http://www.atelier-adb.ch/site/ who are but a few blocks away from where Jean Lassale SA were once located. Of more anon. I was half hoping that as this watch was externally all stainless, it might just have stainless, rather than gold-anodized movement plates. No such luck. Still, at least the bling is hidden inside. 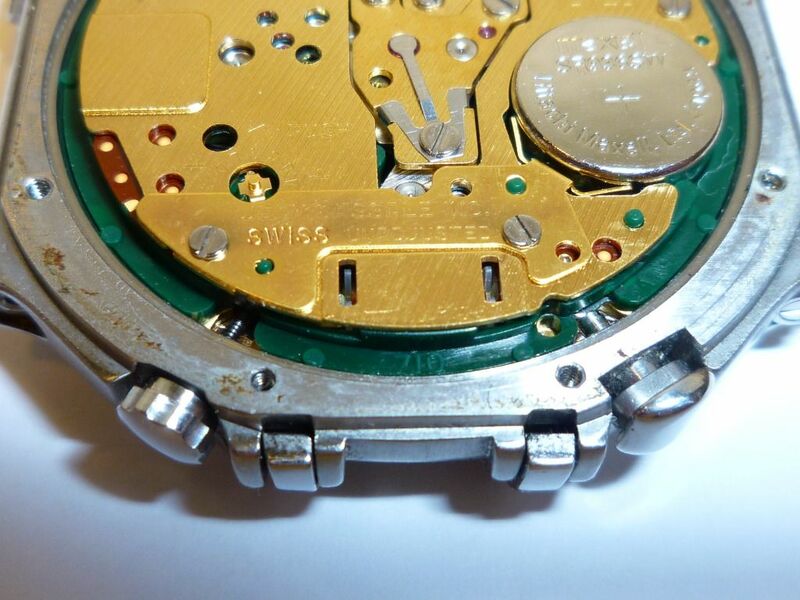 The majority of the stampings on the movement of my Jean Lassale 7A74 were pretty shallow .... apart from the word 'SWISS'. Given the crappy light conditions this morning, please excuse my feeble attempts at photographing it. Just makes you realize, now, how superb those 7A74 movement photos by Mark of Jewelry 'N Loan in the other thread actually were. 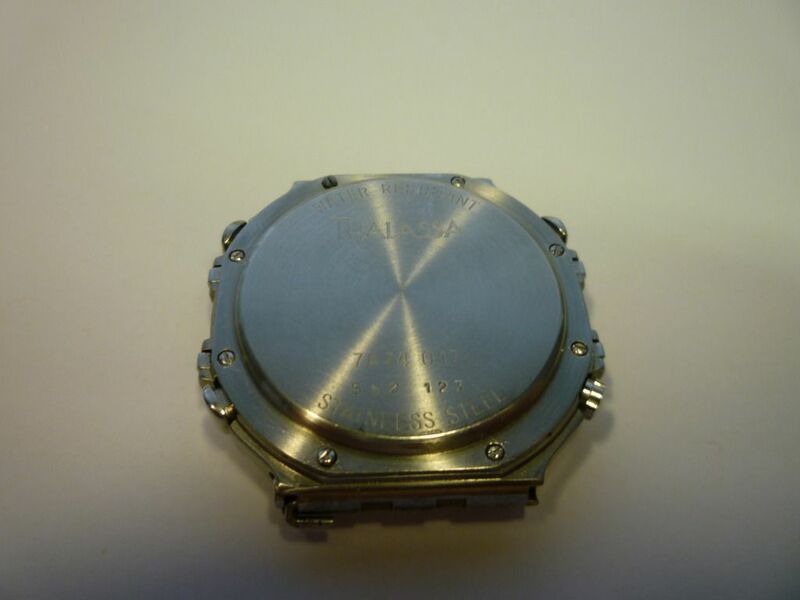 Until I see a photo of the movement backplate, confirming my suspicions, or otherwise, the only doubt in my mind, is: that given the apparent depth of the Tachymeter ring spacer used in these watches, whether this case would be quite deep enough to take a 7A movement with a date complication. 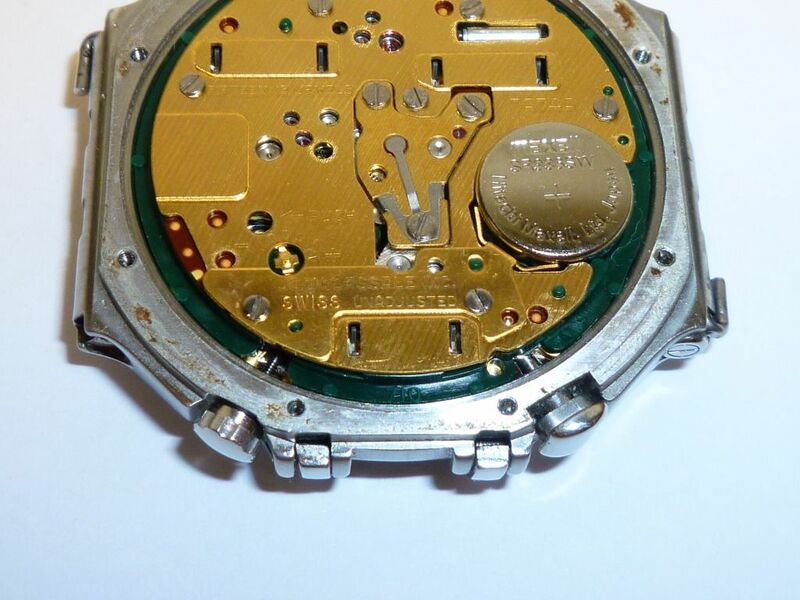 Assuming it's of similar thickness to the Seiko 7A34A movement - which would be approx. 5mm. Which is what I've attempted to show in the next photo. In this last photo, you can see that the edge of the green plastic 710 spacer is exactly flush with the case's O-ring seating flange. No surprises on the dial front, either. 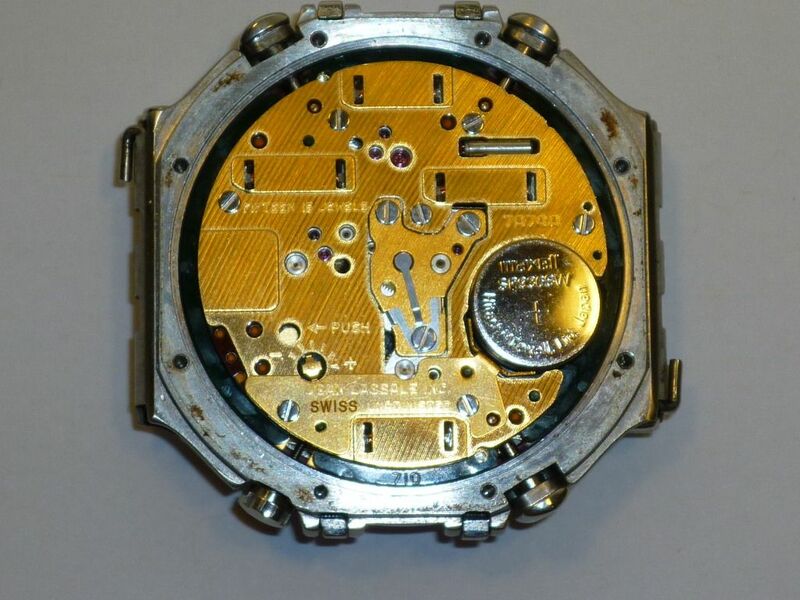 I was hoping there might be a chance of finding a SI - 00x (Seiko Instruments) dial part number, as was printed at the bottom of most Orient J39 and Puma Y19 dials, hidden under the Tachymeter ring. Sadly nothing. The 4 simple plain cut-outs for crown and pushers are the same as a Cartier Ferrari Formula Cal. 531 dial. 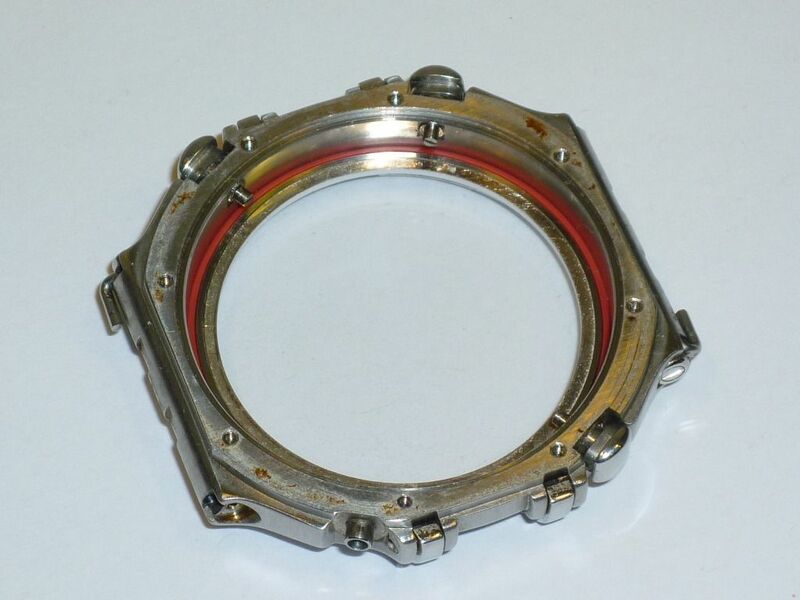 Similarly, there is no means of locating the (metal) Tachymeter ring. The dial is painted flat matt white; the batons and main handset are stainless and the dial printing is dark grey, rather than black. Yes, I had noticed there's some grubbiness at the bottom of the 1/10s subdial that needs cleaning up, and the odd bit of lint, too. These are the components of the 3 pushers. Notice anything 'missing' ? Well I thought there was at first, anyway. On the Junghans High Tech, which uses very similar screw-together pushers, there are two miniature O-rings on each pusher shaft. At first, because the screws were quite loose on two pushers, I thought they might have been omitted, during a previous service. But if you look carefully at the left-most and inverted pusher button, around the post there's another of those Sanfil nylon gaskets. One thing's for sure, you wouldn't want to risk doing the washing up, let alone going swimming with a Thalassa 7A74 on your wrist. Anyway, having got the pushers out of the way, gave me access to 4 screws to remove the two sections of the bezel - or so I thought. Except that they were in murder tight, and wouldn't budge. So it looks now like I'll be lapping and polishing the bezel in situ. Again, the natural available daylight is at best 'variable' this morning, so I've taken 2 pairs of photos, one by flash for better clarity. The top surface of the bezel has been lapped, face down on a piece of plate glass, using 1200 then 2000 grade Wet and Dry paper. I did one half at a time, and needed to remove surprisingly little material to completely eradicate the scratches at '400' on the bezel. The little dings on the periphery of the lower half of the bezel weren't quite so easy, and some evidence of them still remains. I then polished the bezel using felt wheels in my mini-drill and AutoGlym metal polish. I find it works better than Solvol Autosol. This is a 'first pass', and I may yet attempt to more evenly smooth / blend in the radii of the bezel's curved side extensions. To facilitate the lapping process, and to prevent any polishing residue getting inside, I'd re-fitted the case-back. Only roughly. I didn't bother tightening all the screws properly, as a couple of them went tight on me as I screwed them in, so I just left them. I think I've found the reason for the pushers sticking in when used (apart from lack of lubrication). and you'll see that there are 3 raised 'pips' around the edge, which, when fitted to the case form the 4th side of the pusher housings. They're hand finished, and I'd say not particularly well on this example - they're not even parallel to the case-back joint. Excuse fingers. That might explain why (as received) a number case-back screws were loose. Perhaps someone loosened them to free the pushers. A quick clean up job, with a fine file, on those case-back lugs solved the sticking pusher problem, but that wasn't the end of my woes. Sunday night, I made a half-hearted job of reassembling the watch, and failed. The problem being those g*ddam case-back screws. I managed to get 4 of them in again, but there was no hope for the other three screws whose slots were already badly damaged. 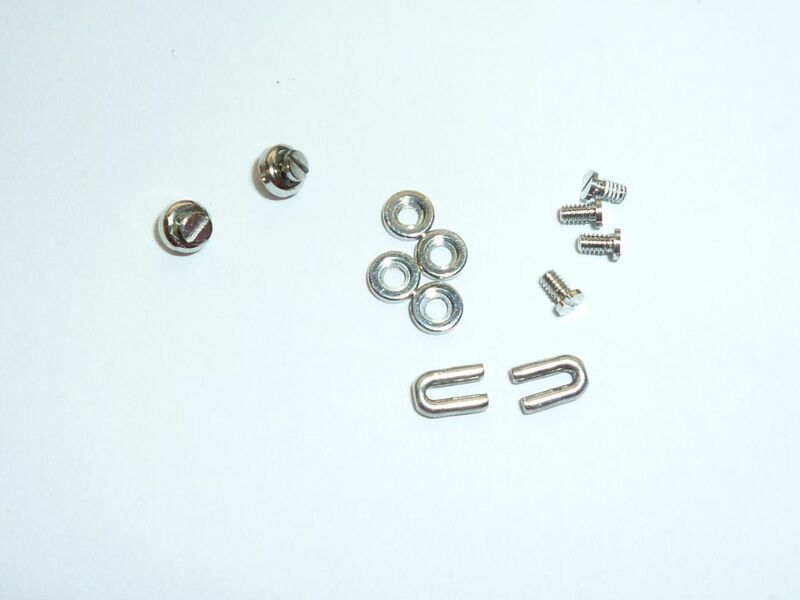 So on Monday, I started ringing around various UK suppliers of micro miniature fasteners. I hadn't previously given the full and critical dimensions of the existing screws. Not only are they M1.0 x 1.4mm long, but they also have a disproportionately small head diameter - of only 1.5mm (max). So, in effect, they're 'specials'. Typical ! I'd originally been hoping to find a better engineered solution, possibly in the form of stainless micro socket head capscrews (allen head screws), but the smallest thread size anyone did was M1.4. So it looked like I was going to be stuck with using (a better) slotted screw. There was one saving grace, possibly, in that I had probed the tappings in the watch case, and found that they were 2.0mm deep, so I could consider using slightly longer screws in place of the originals. These are what I've looked at so far, and managed to cadge a couple of free samples of (enough to actually do the job - 10 of each). 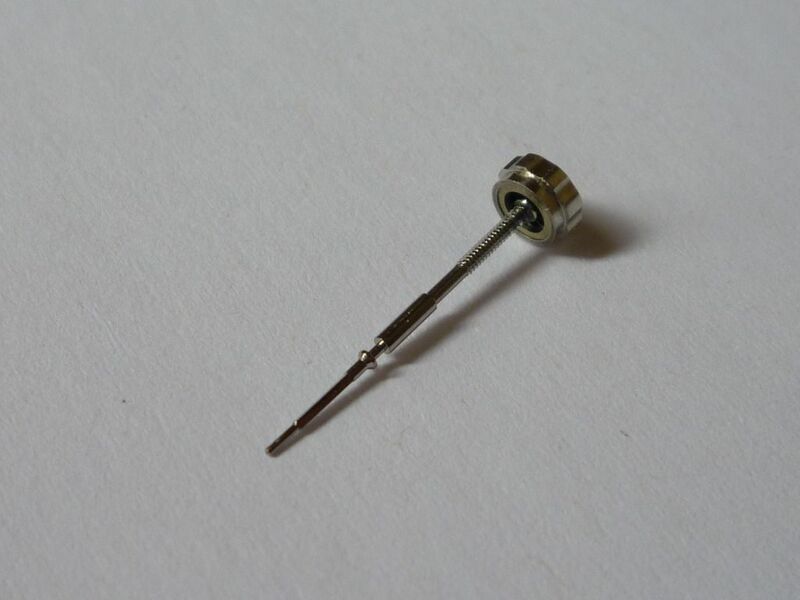 http://www.microfastenings.com/MachineScrewThreads.aspx - M1.0 x 2.0mm MICRO MINIATURE PAN PHILLIPS MACHINE SCREW. The stated head diameter size in the table is 1.8mm (D max), which would have theoretically required turning down, but when they arrived, this morning, I measured the heads to find they were only 1.25mm Ø ! Apart from the slight risk of them pulling through the countersunk holes, the Phillips 'X slot' is absolutely microscopic - much smaller even than my Phillips '0000' size screwdriver ! However, the very helpful salesman I spoke to remembered that they also had some residual stock from a special customer order. Their heads were actually 1.8mm diameter ! So if I do use them, and I'd actually prefer 2.0mm of thread length, their heads are going to need machining down. Problem with that, is that their 1.5mm length doesn't allow much purchase (in a Dremel chuck) for turning. Again, assuming their specification table is correct, these are also going to require their heads turning down from 2.0mm to 1.5mm Ø.
I know you'll have considered this Paul, but what are your thoughts on using a bigger screw? There appears to be enough room to re-tap the case and drill out, re-counter sink the case back. Obviously it would take it away from 'original' but would be an improvement, and not seen (as such). I agree that allen or torx type heads would be a good alternative. I hadn't actually considered re-tapping the threads in the watch case (at all) - I think the labour costs involved would be prohibitive, that's even if I could find somebody who would take the job on. 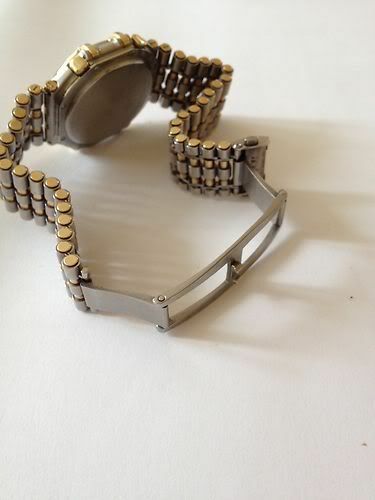 I had considered increasing the diameters of the existing countersunk holes in the caseback (2.0mm max.) myself, but am extremely wary of the (lack of) thickness of the case-back flange, and mis-drilling. - never metric. Haven given it further thought, seeing as all the other screws on the watch are slotted cheese heads, that's probably what I'm going to go with. Their flat tops will at least allow a screwdriver a better purchase than the original slotted dome head screws. There's time for a couple of off-topic rambles. 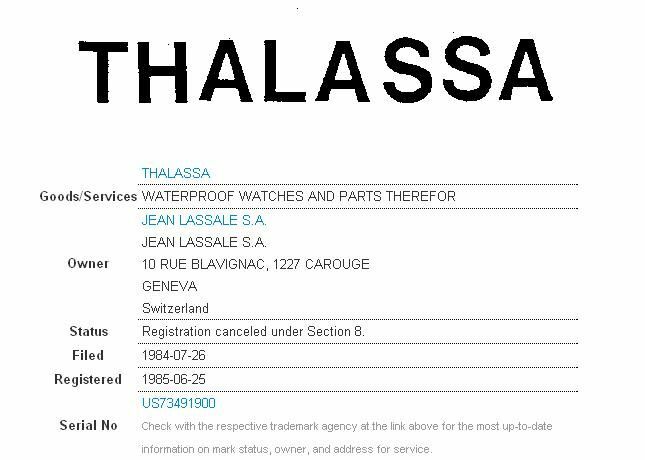 You may remember from the other Thalassa 7A74 thread, I'd been googling, looking for a period advert for a Thalassa chronograph. Yes, I did manage to find that awful reproduction of an advert from the Anchorage Daily News, which included an illustration of one. I hadn't given up, altogether, and later found this one, which was nearly as bad quality. 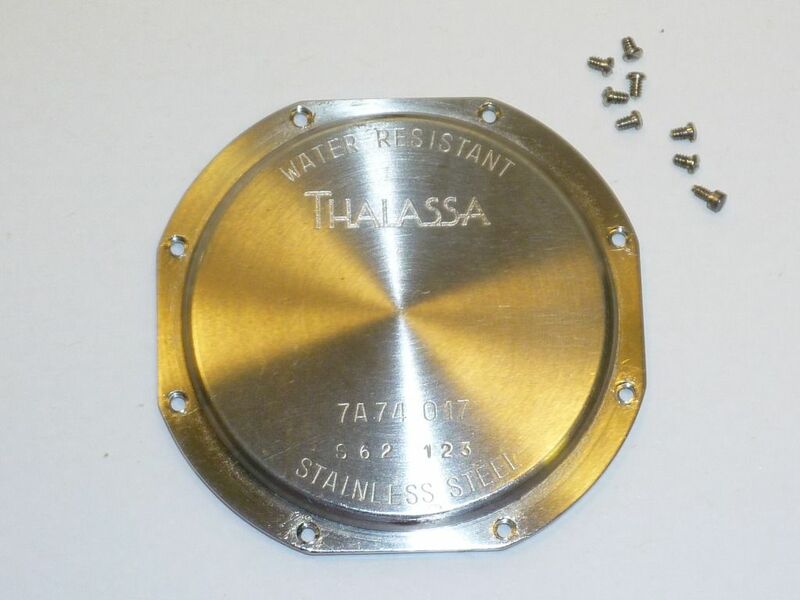 Remembering the original purchaser of my stainless Thalassa 7A74-017 had been the Advertising Sales Manager for the New Yorker magazine; she'd said the wholesaler had advertised with them, I thought I'd try including the magazine title in a few google searches. Has anybody ever tried a google 'books' search ? Again, it's amazing some of the stuff you can find - if you choose the right criteria. The reason being that the New Yorker expects people to pay for accessing their archives - even 25 year old issues !! See: http://archives.newyorker.com/?iid=15977&startpage=page0000018 - and that's at $5.99 per issue, too ! 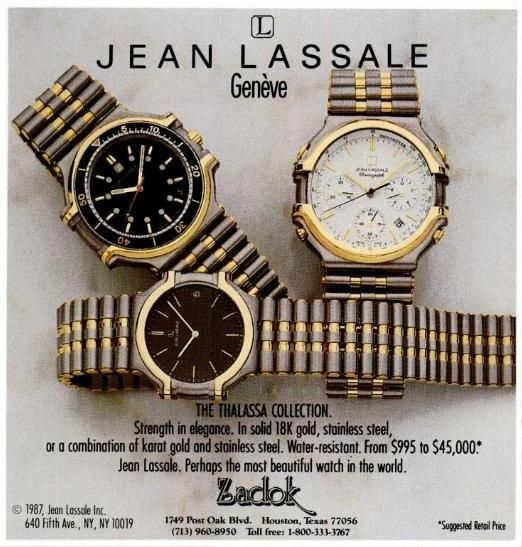 Instead, completely for free, I found loads of Jean Lassale adverts in their rival publication - 'New York' magazine. The next one falls under the category of 'close but no cigar'. 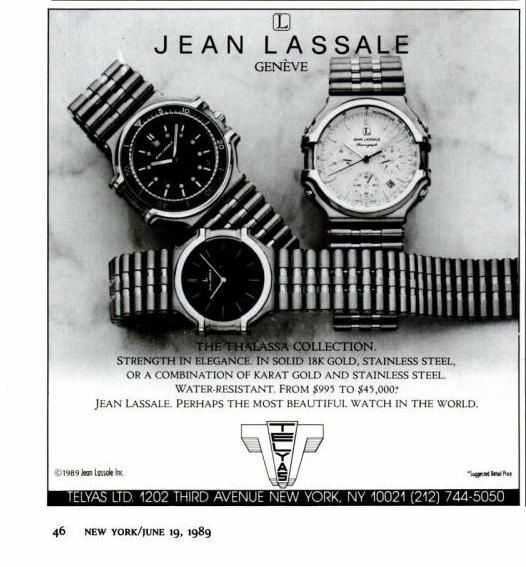 This Jean Lassale advert in an as yet unidentified 1989 issue of Vanity Fair magazine was only visible as a 'snippet view', showing only the relevant highlighted text. The non-availability of the full magazine online is possibly attributable to the fact that, like the New Yorker, Vanity Fair is owned by Condé Nast publishing, who only grant free access to achived issues to their subscribers. So my all-stainless 7A74-017 was indeed the 'Poor Man's Thalassa 7A74 - a mere $1800 in 1988. But let's put that in perspective. That's a 6:1 differential in R.R.P. 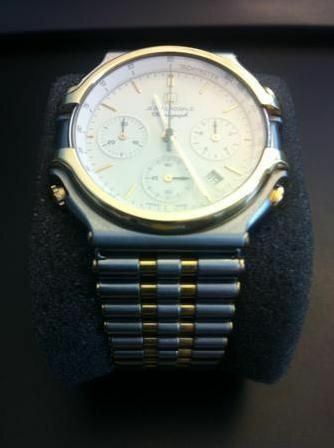 between the $295 Seiko 7A38 and the 'bargain-basement entry-level' Thalassa 7A74 @ $1800 !! Calculating inflation from 1988 - 2012 at factor of 1.94, that would be equivalent to almost $3500 in today's money. Scary thought. 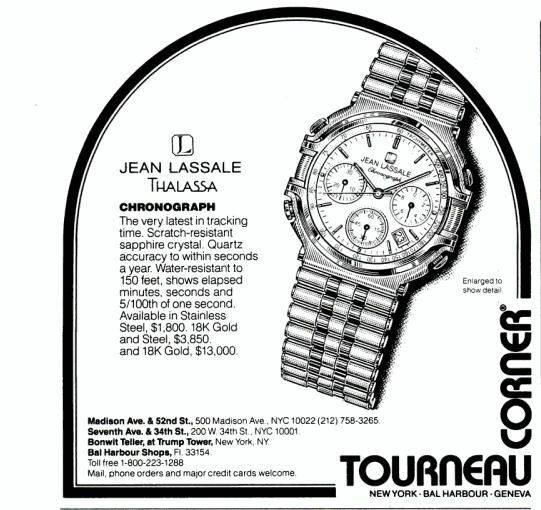 What's even worse, check out the price of the stainless + 18K two-tone Thalassa 7A74 in 1988 - $3850 - that's + $2050 on top !! Obviously partly related to the price of gold, but perhaps there was also an element of 'let's see what can we get away with' built in. Gold was at a high of $850 / troy ounce in 1980, but by 1988 had fallen back to $500 per ounce. Today's price is around $1600 / oz. So, with the all 18K version of the Thalassa 7A74 at $13,000 in 1988 doesn't even begin to bear thinking about in today's money. As you've probably gathered, I'm an avid google user - though sometimes it's easy to be led astray by the wrong conclusions. 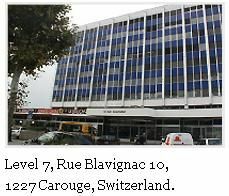 Note the address given as CH-1227 Carouge. Three days later, I hadn't received any reply to my email. At first I put it down to typically Swiss 'discretion', but now I know I was barking up the wrong tree. 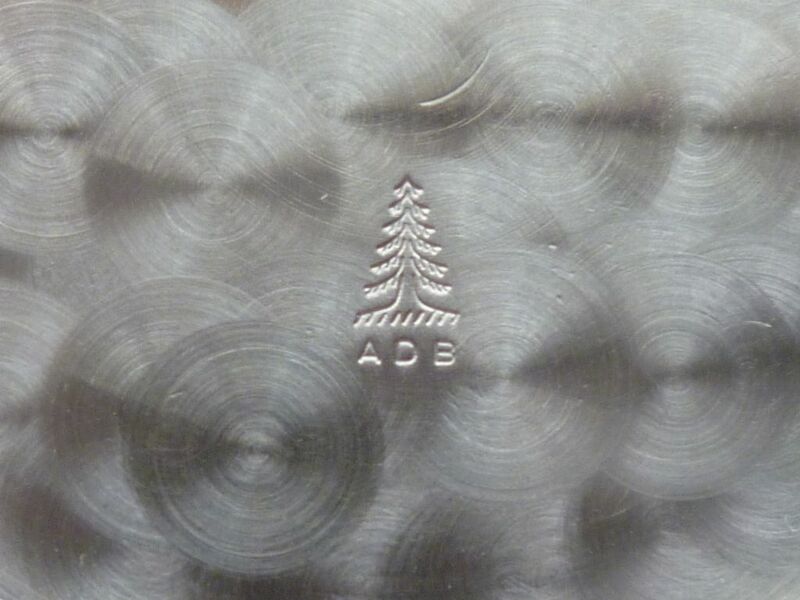 Further googling on Atelier Dominique Broillet, it turns out that they're actually a graphic design business (possibly explaining their minimalist web design), rather than a watchmaking house. The word 'Atelier' can mean either a workshop or studio. The fact that they are located fairly close to where Jean Lassale SA once were is just a coincidence in this particular instance. Meanwhile, I'd been flicking through various scans of US glossy magazines, looking for adverts for Jean Lassale Thalassa 7A74's. One thing struck me particularly, was that the way so many adverts would have appealed to their gullible target American customers. 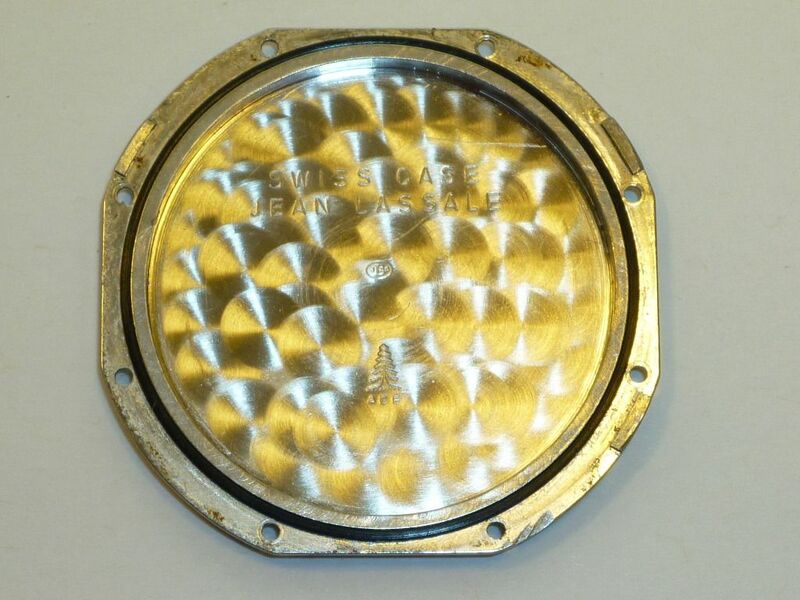 Look at the top of every advert, and you'll see Jean Lassale Genève. Obviously playing on the allure of the puppet Swiss company. But they probably just had a suite in the building. Looks quite impressive and sounds almost picturesque, doesn't it ? 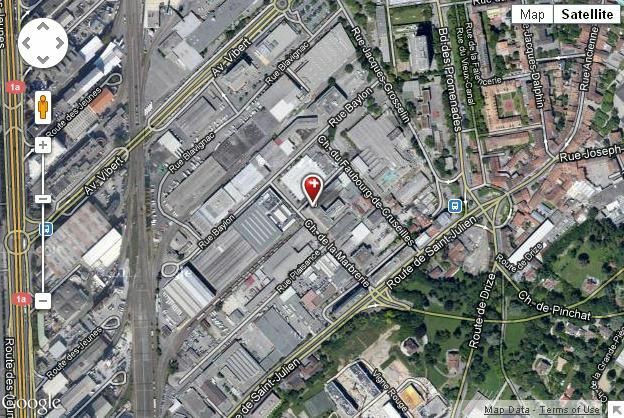 but they're somewhat closer to the city of Geneva than 10, Rue Blavignac - which is on an industrial park near the railway sidings !!! Not quite such a glamorous location, now you see where it actually is, eh ? 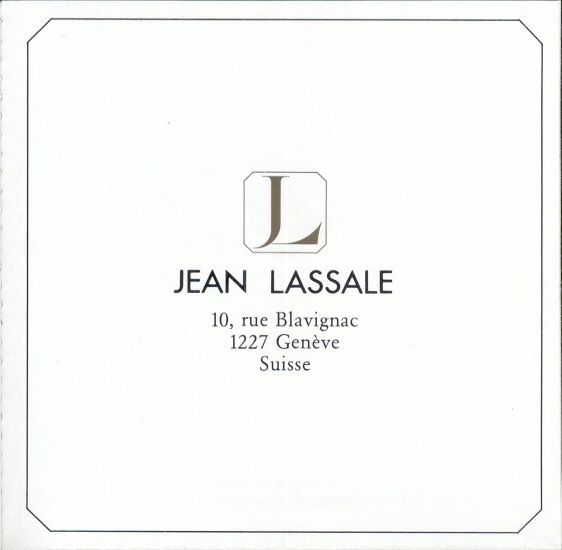 The Jean Lassale SA company was excluded from the Swiss Chamber of Commerce on 10 April 2006, following the bankruptcy that was declared by the Tribunal de Première Instance dated 23 June 2003. The company's last CEO was Mr Hagiwara Yasunori. 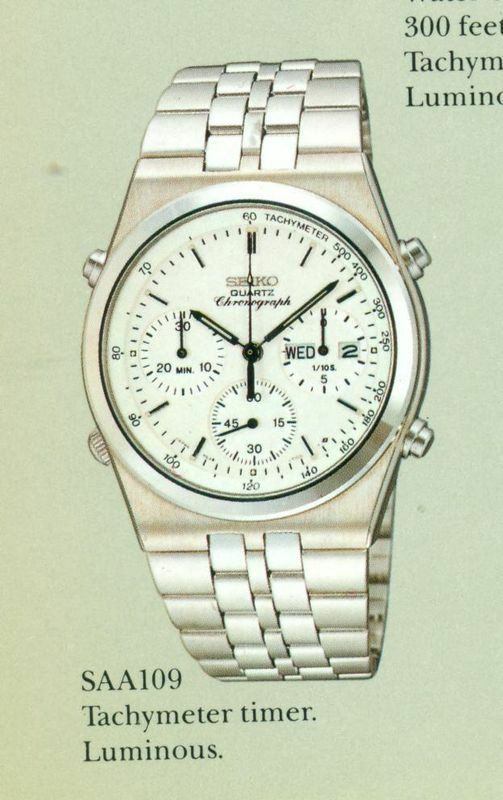 Seiko SA, à Carouge (GE), commercialisation, distribution et service après-vente de montres et de produits d'horlogerie, notamment ceux de la marque 'Seiko' (FOSC du 15.11.2001, p. 9003). New legal seat: Genève, chemin De-Normandie 14, c/o KPMG Legal. leurs pouvoirs sont radiés. Beauverd Pierre, de Genève, à Veyrier, est administrateur unique avec signature individuelle. Jean Lassale SA, à Carouge (GE), fabrication de tous articles de bijouterie, etc. (FOSC du 19.06.1997, p. 4270). 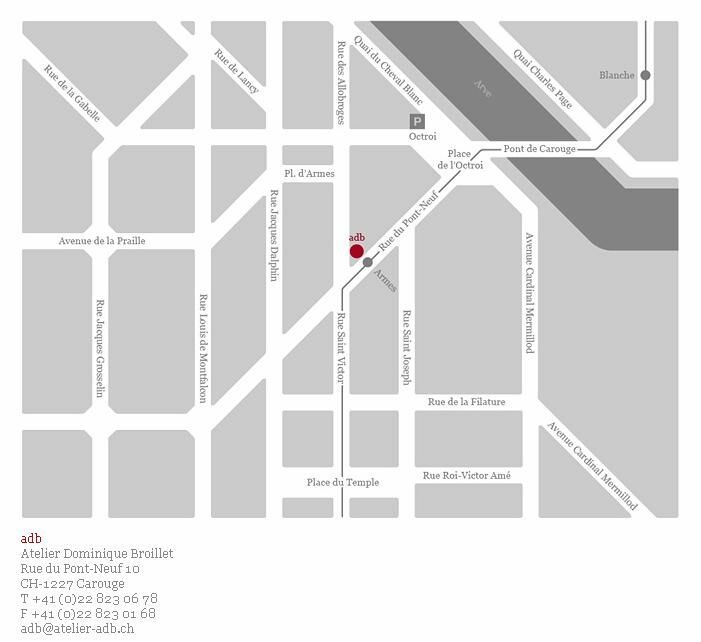 New address: Chemin de la Marbrerie 3. 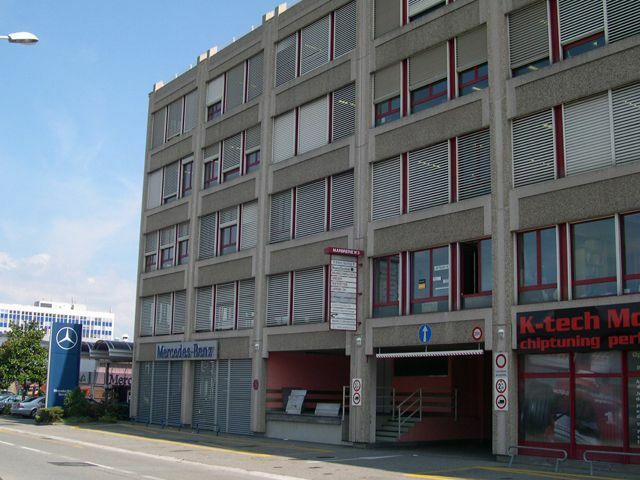 Seiko SA,à Carouge (GE), distribution et service après-vente de montres, etc. (FOSC du 18.08.1997, p. 5945). Besides Yasunori Hagiwara, the two companies also shared two named directors: Denis Dubois-Ferrière and Franz Zimmermann. 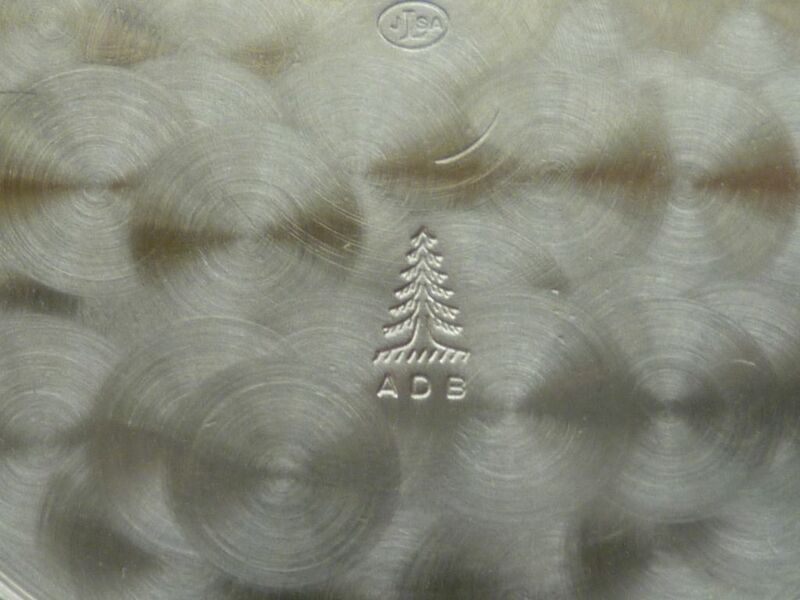 Finding the real atelier ADB who stamped those case-backs with his 'Christmas Tree' mark may eventually uncover the truth. 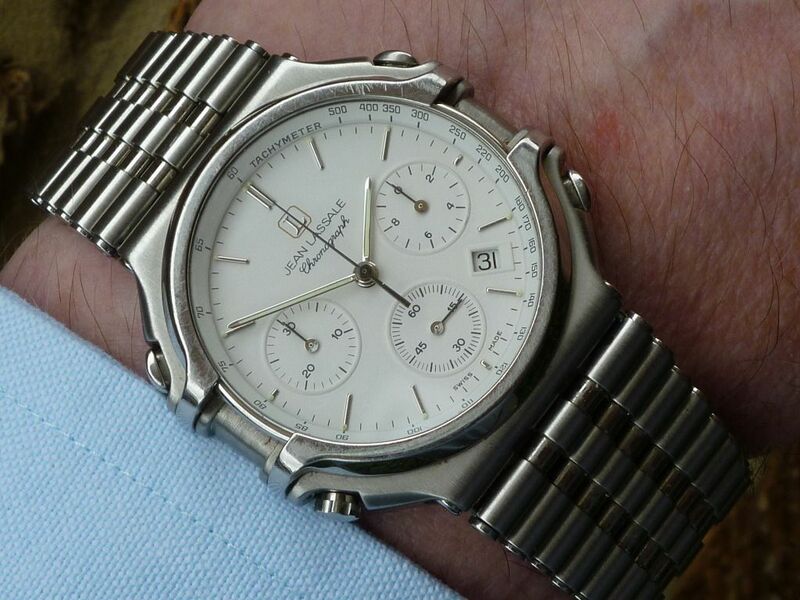 Nice project Paul, my brother has just moved to Geneva Switzerland and is a trader there, I am due to visit him soon and will have a good search around for Seiko watches. Let me know if I can help in anyway searching for particular models etc. Thanks, Chris - replied by PM. This afternoon, while anyone who had any sense was outside enjoying the sun, I was sweating over a hot Dremel. No more free samples of miniature screws were forthcoming, so I decided to make the best of what I'd already scrounged. I left those 10 'specials' soaking overnight in cellulose thinners, to soften and hopefully dissolve their thread-lock patches. Once I'd cleaned as much of it off as I could, I set about dremeling their heads down to fit the countersunk recesses in the case-back. Oddly one of the screws had a slot cut off centre, and so I started with that one, as a test, and ground it too small - 1.49mm ! Then the third one shot out of the chuck as I was giving it a final pass, and in doing so, it picked up an unintended bevelled edge. By some minor miracle, I ended up with 8 screws with head diameters of 1.53mm +/- 0.01 mm. Just don't ask me how I did it !! Because a couple of the case threads were already a bit iffy, I decided to use that odd replacement screw with the tall cheese head that someone had fitted in lieu of a lost or damaged original, to run the threads through. I'd done 3 and was about to start the fourth when I realized why it was going in so smoothly, compared to the other screws. It was a different finer thread - presumably UNF !!! By which point, I'd wasted enough time faffing about, and decided to bite the bullet. I made sure the new case-back gasket was seated properly, gave the joint faces a light smear of silicone grease, and started putting my own new screws in. I worked diagonally back and forth across the case-back, tightening them in turn as one would a car's cylinder head. I still managed to make a slip once or twice. But now I'm confident the case-back is sealed properly, and that all the screws are evenly tightened, and aren't likely to drop out. It's not a high-tech solution, as I'd originally planned. It may not be pretty; there are still 'battle scars' on the case-back - but it works. 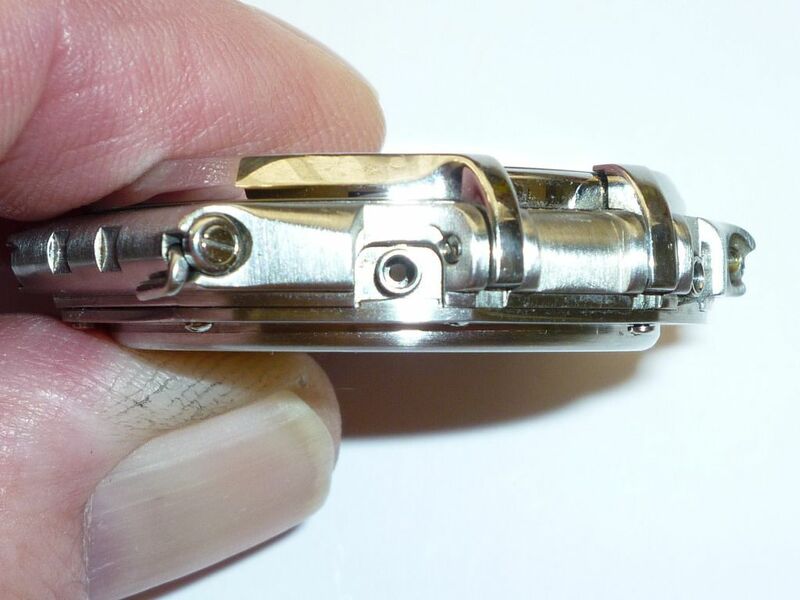 A 'hidden' snap-fix over-centre Z-fold used on the 'Swiss Made' versions and a push-button butterfly clasp on the non-Swiss watches. In hindsight, that was obviously an incorrect assumption, because here's my 'Swiss Made' 7A74-017 fitted with the push-button clasp. In fact, it appears there were three variations of clasp used. 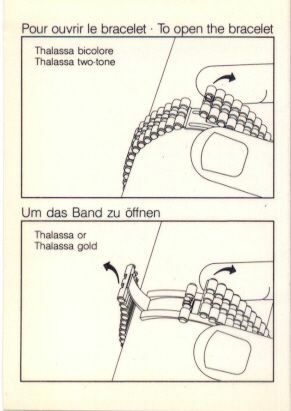 Maybe we better make that 4 different methods of bracelet closure used on Thalassas, because both those above are different. 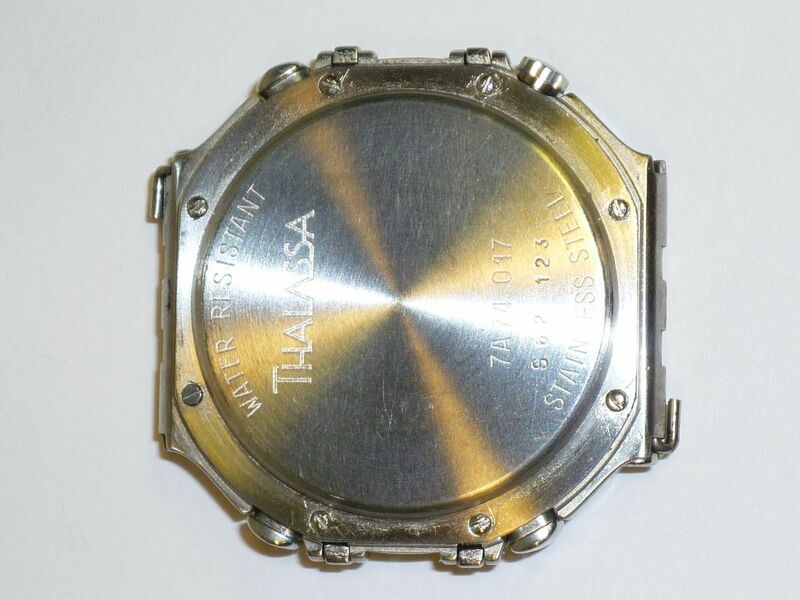 What I was going to point out, before I studied those two illustrations properly, is that all the snap-fix hidden closure bracelets that I've seen on Thalassa 7A74's, to date, appear to be missing their little L logo badge, which would indicate where to open the bracelet. Before I screw the bracelet back onto my watch - tomorrow, here's a photo of that beautifully engineered push-button butterfly clasp. I was going to give the outer parts of clasp a quick re-brushing with a fibreglass pen to remove a few indiscernible desk-diver marks. This was going to be my 'before' photo. So I don't think I'll bother at all now ! I tried to rattle off a few photos this morning - the sun playing 'hide and seek' behinds clouds every couple of seconds didn't help. I was extremely relieved there wasn't a single tiny mark on mine, despite the fact that the seller said there were in her description. 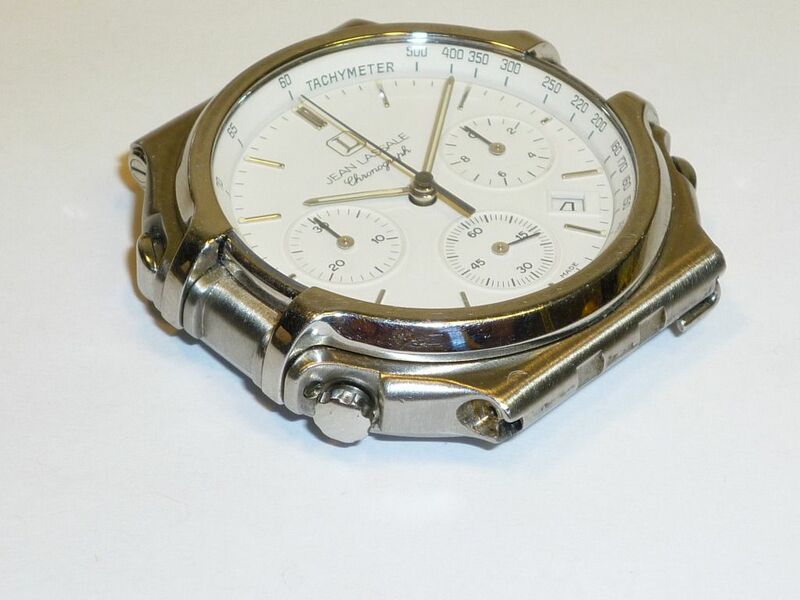 Note the comparative apparent depth / lack of thickness between the Tachymeter ring and sapphire crystal in the above photo. It's considerably heavier than any 7A38 - even the hefty-looking 7A38-6020, mostly due to the bracelet. I'll do some comparison weighing later. 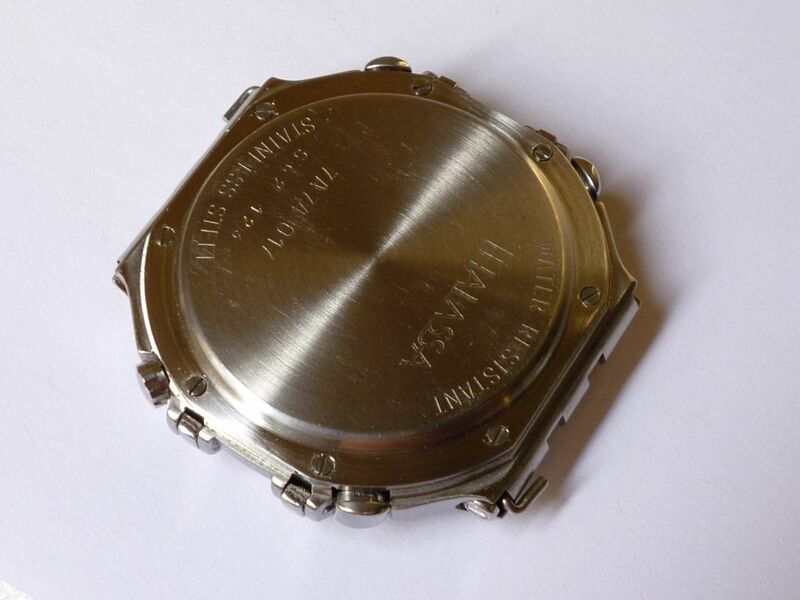 Overall, it gives an impression of being extremely well engineered, particularly as this one is in all stainless steel. In between taking those, I had to go to the Post Office. So I took a couple of other watches along with me, to check on their scales. 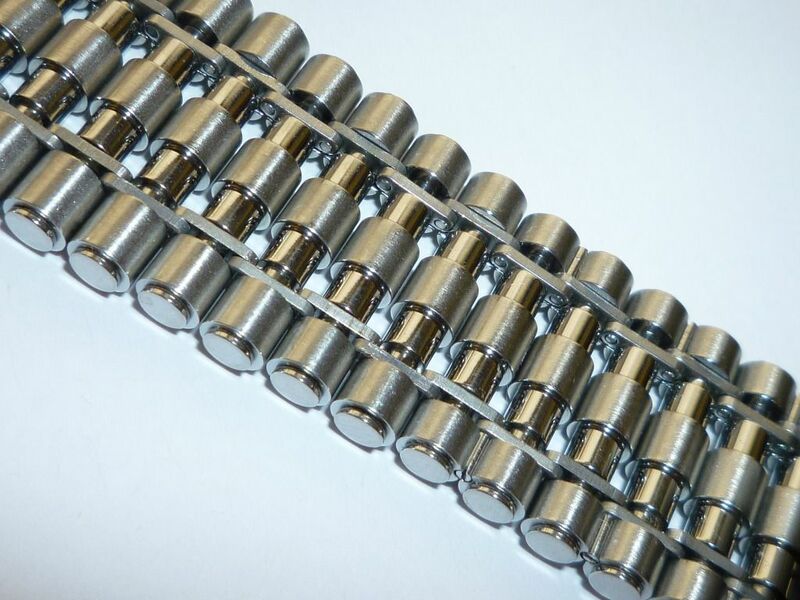 A stainless 7A38-7280 weighs a shade over 90 grams. 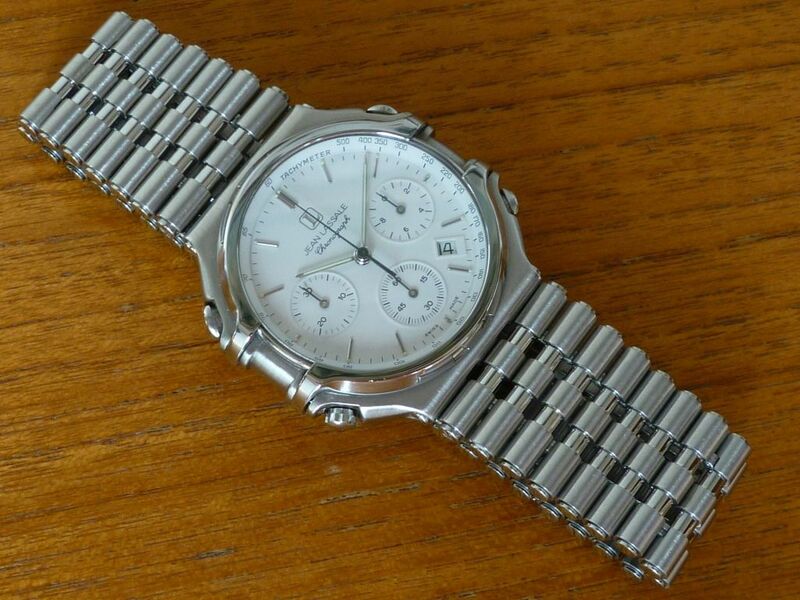 My heaviest Seiko 7A38 - a stainless 7A38-6020 weighed in at 130 grams. 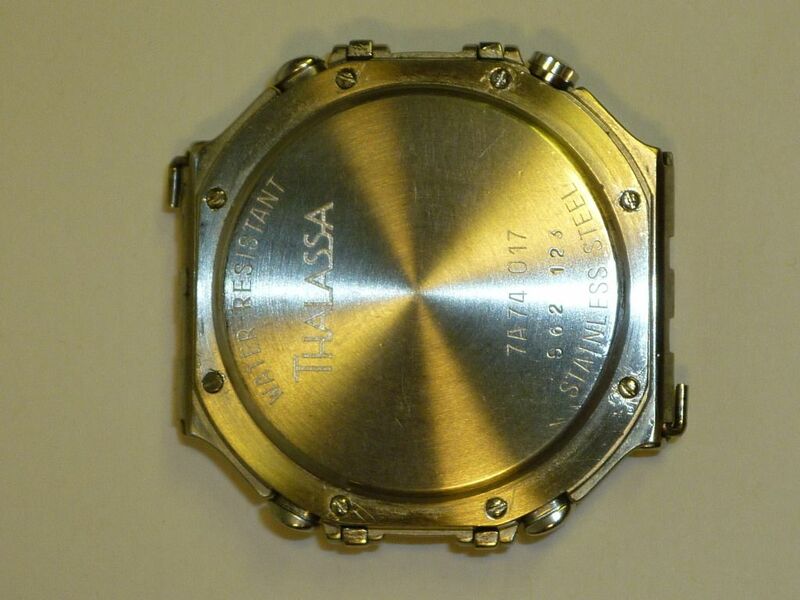 The all-stainless Jean Lassale Thalassa 7A74 wasn't quite as heavy as I'd expected - at only 115 grams. But still no light-weight. The sun came out again this afternoon, long enough for me to get a half-decent wrist shot. Who says you need 18K gold for bling ? This isn't a case of 'Buyer's Remorse' kicking in - far from it. I'm still more than happy with my 'Poor Man's all-stainless 7A74-017. I did look long and hard at the one on offer by Jewellery n’ Loan in Costa Mesa, which was one of the first Thalassa 7A74's I saw. .... 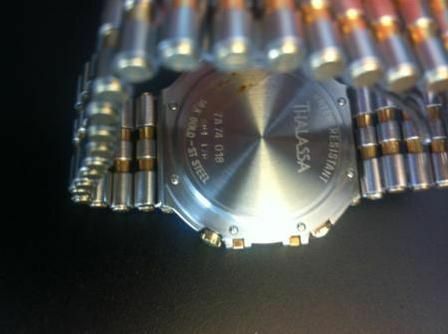 So, if I bought a Thalassa 7A74, did it really need to be a stainless and 18ct gold two-tone ? Did I need the bling factor ? .... 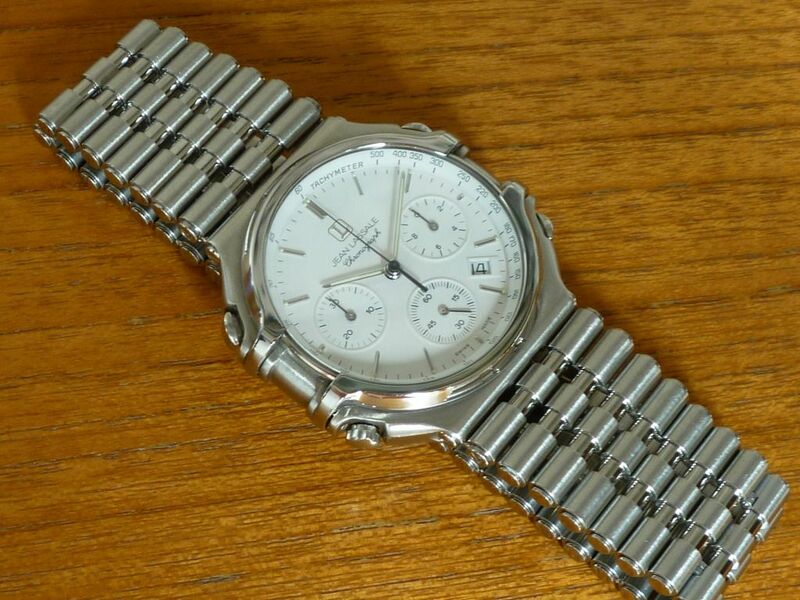 So, in the third week of July, I messaged the eBay seller, and asked if the watch was still available - seems it was. So .... Guess what was also for sale in the third second week of July ? 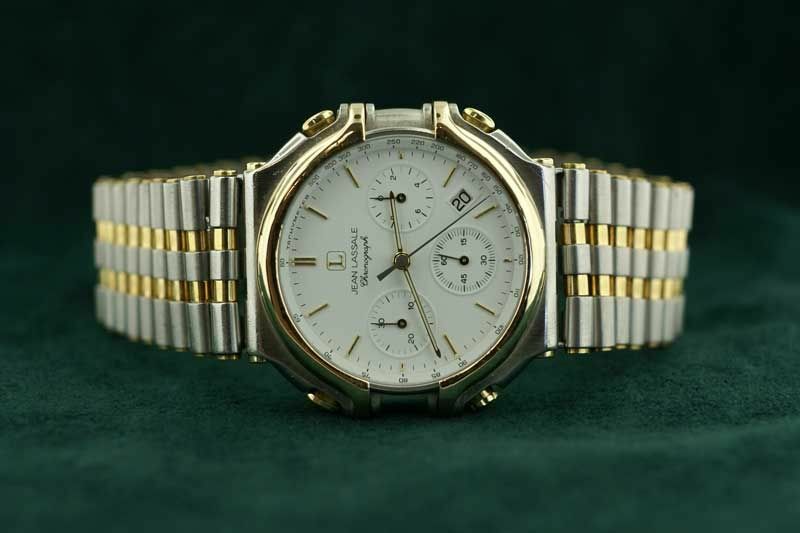 Yup - a stainless and 18K gold Thalassa 7A74-018 with a white dial - 'Swiss Made'. I only stumbled across this listing yesterday. 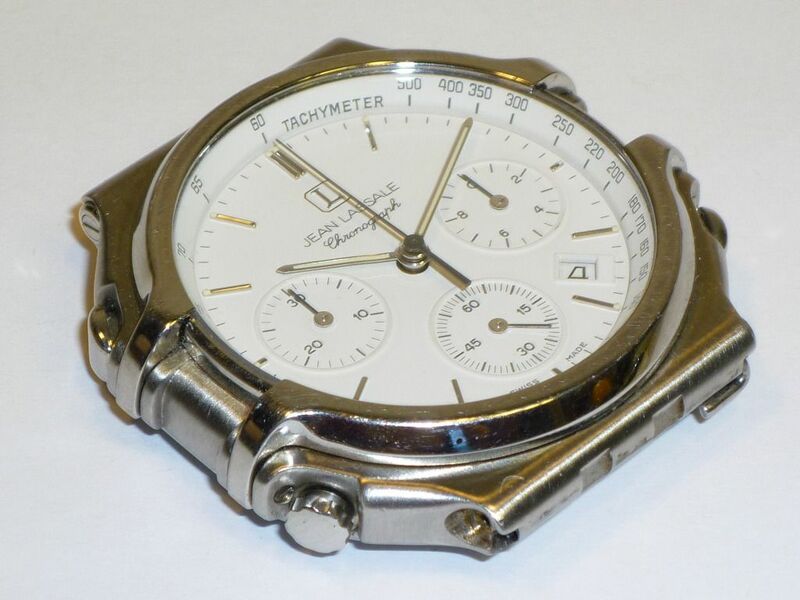 Montre en or 18 k / acier, swiss made, chronograph tachymeter, bracelet en or 18 k / acier, en parfait état, numerotée, service effectué, marque connue par leur célèbre montre la plus plate au monde présentée au salon international à Bâle. The Ricardo.ch listing had actually ended the week before, on 16th July. The opening bid price was a reasonable 1000 Swiss Francs.